Posted on September 26, 2013 by Dayna B. But, our curiosity got the best of us! 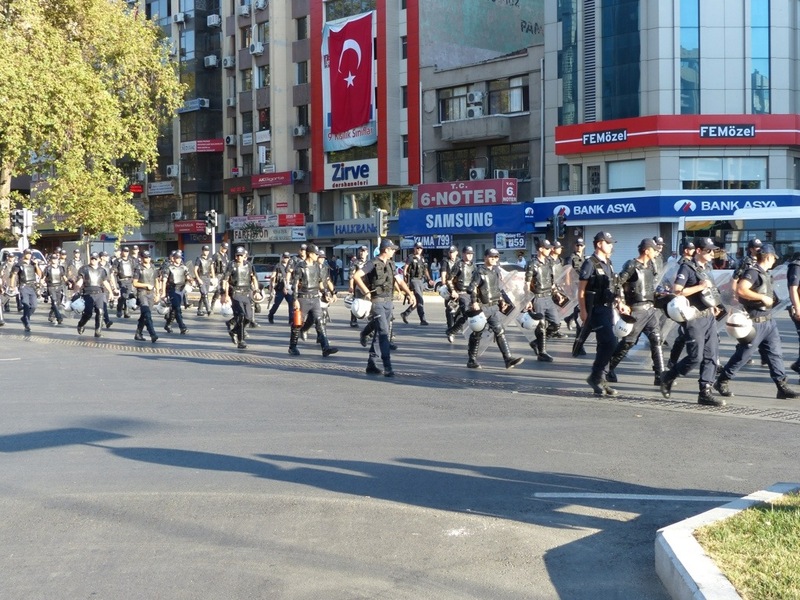 And it just so happened that the protest was marching in the same direction we were headed. 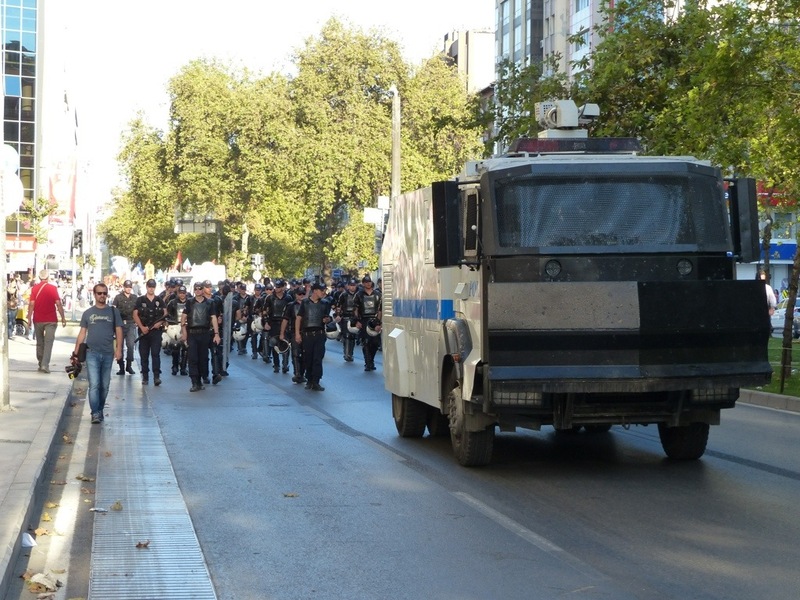 We were still a decent distance ahead of the march, but I was able to rely on my mega-zoom camera to get a glimpse of the action while maintaining a “safe” distance. Our tour guide had actually mentioned the protest to us before dropping us off at our hotel (a tidbit of information that I apparently slept through), so Rob did a bit of research before we headed out. 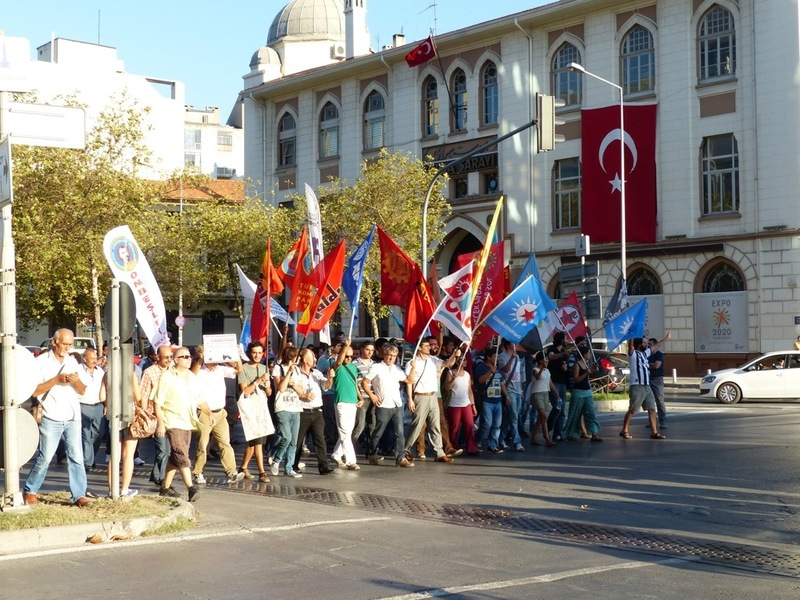 According to this article, they were protesting a change to the Turkish Constitution that would lift the ban on turbans at Turkish universities. 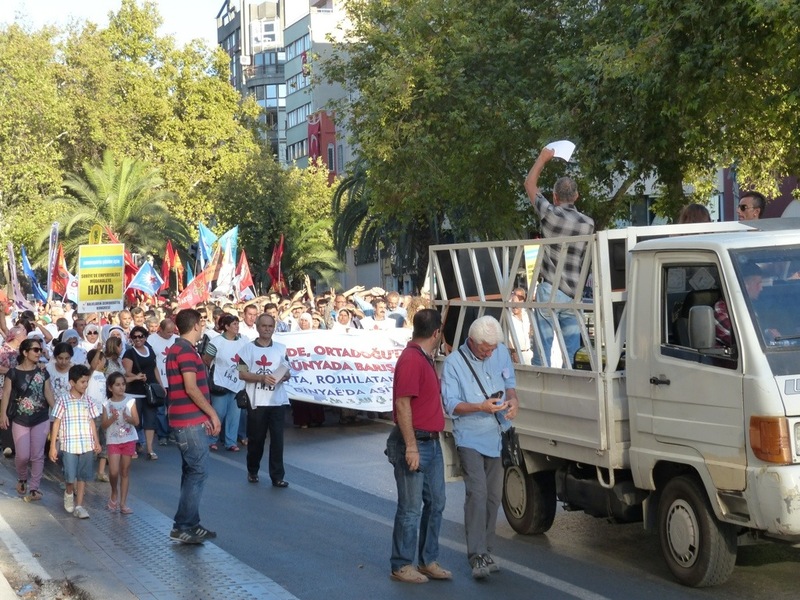 Ok, so this protest had nothing to do with Syria or the American Government…sounds safe enough to me! Does someone want me to carry a sign or something? Disclaimer: This post is not meant to encourage others to defy the State Department. We did so at our own risk. That’s how we roll! 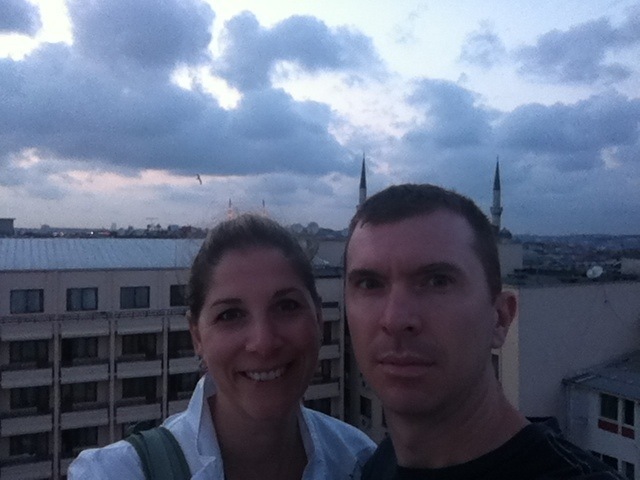 Rob and I spent 2 nights in Izmir, which is Turkey’s 3rd largest city (behind only Istanbul and Ankara). 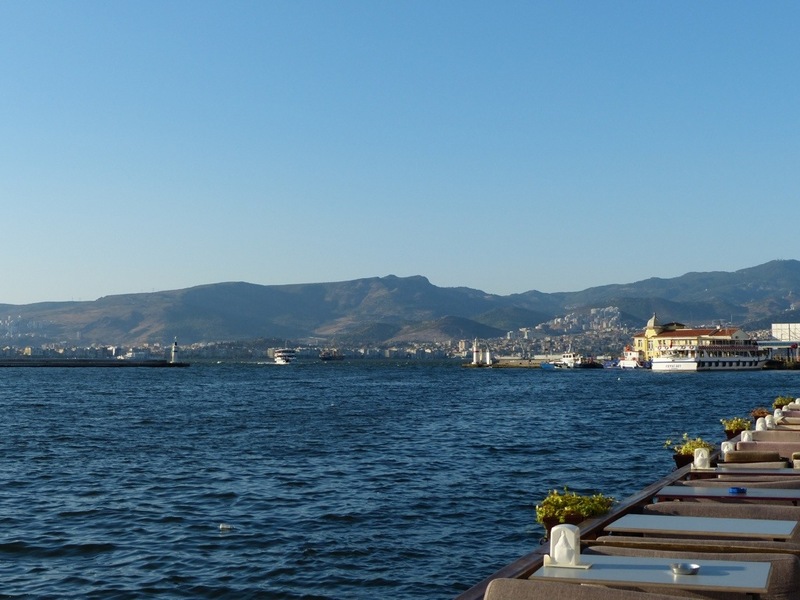 The ancient city of Izmir was called Smyrna, but it was officially changed to Izmir in 1930 (according to our tour guide, the name “Smyrna” was difficult for the Turks to pronounce). 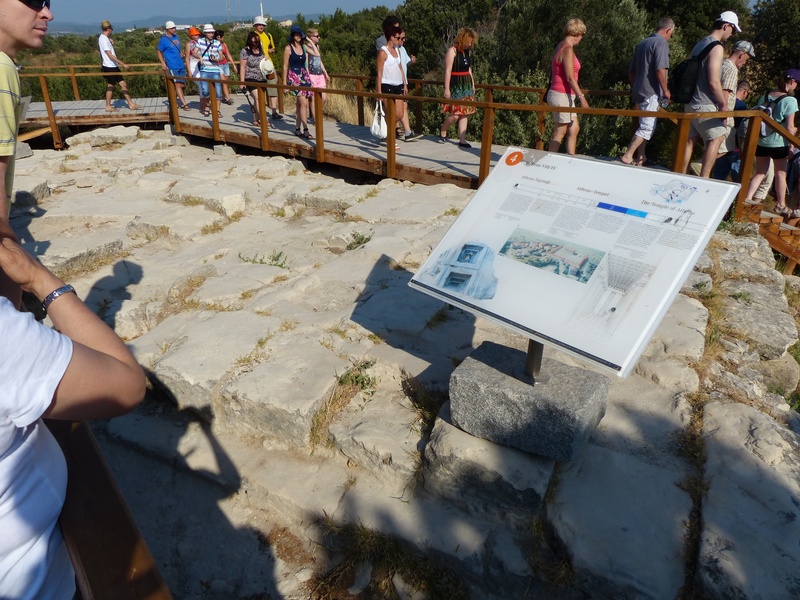 We didn’t get to see too much of the city because our days were spent touring two different ancient ruin sites (more on that later). 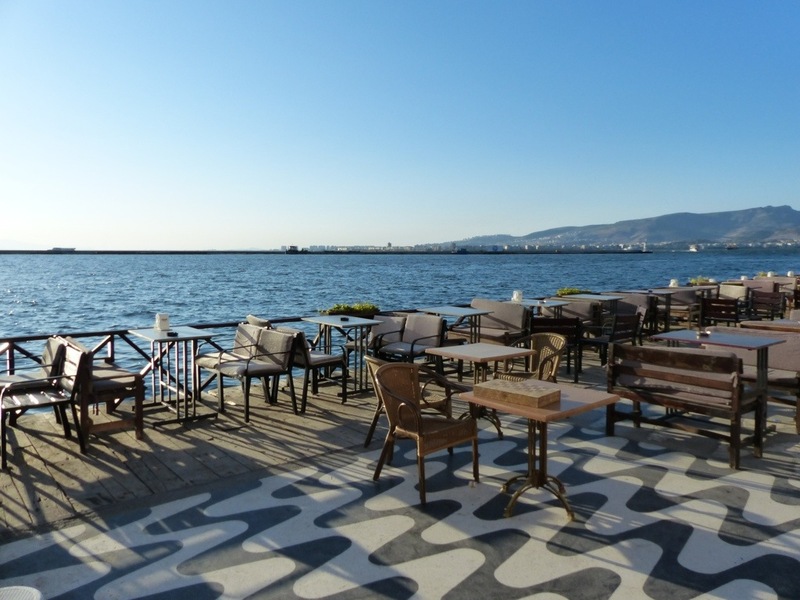 But our hotel was a short walk to the waterfront along the Gulf of Izmir which feeds into the Aegean Sea. 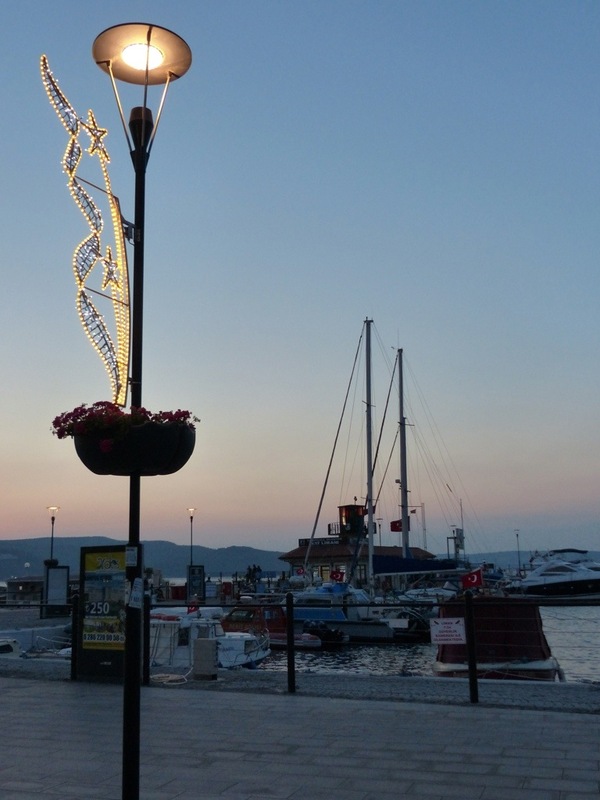 So we spent our evenings cruising along the waterfront. 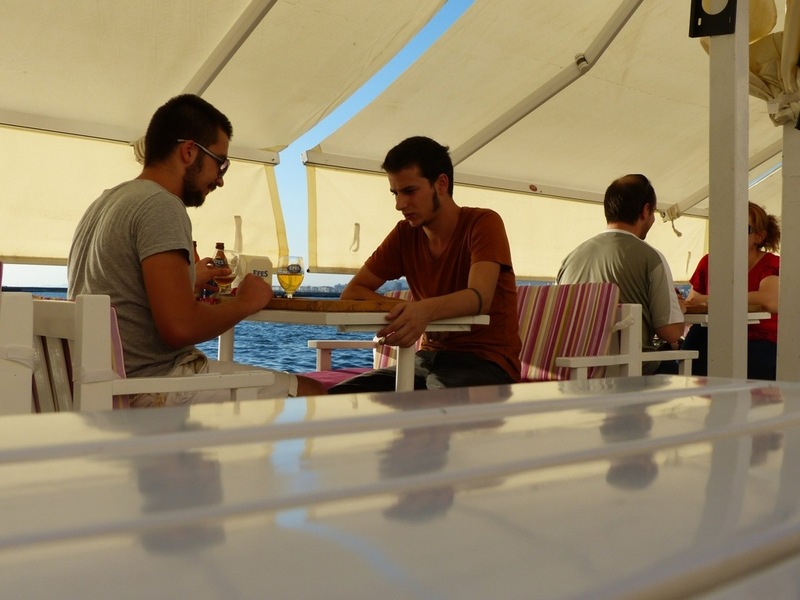 It seemed as though the entire coast was lined with waterfront cafes. 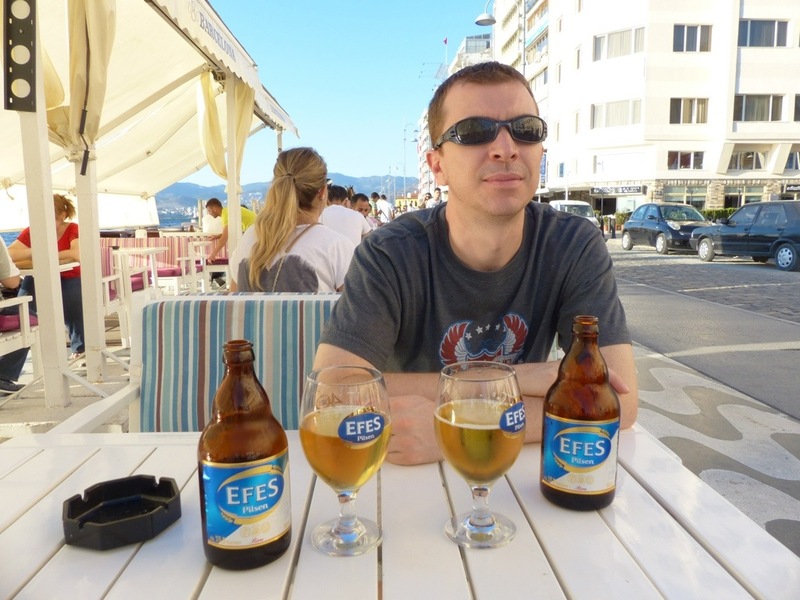 It was the perfect spot to enjoy a beer and people watch. 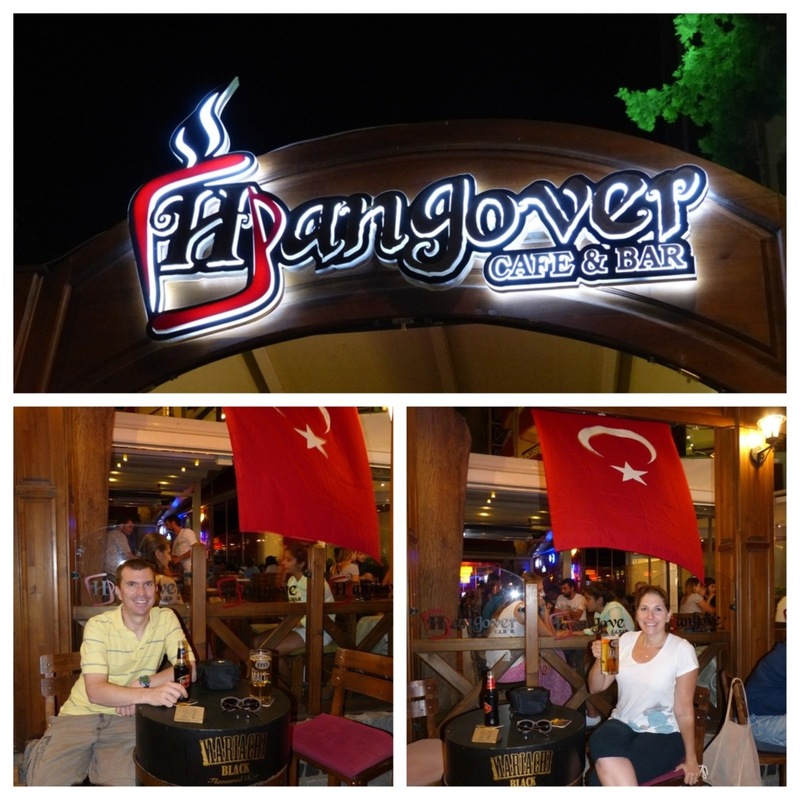 Most of the cafes provided board games upon request and we saw a lot of people playing backgammon. I really wish I remembered how to play because it looked like a fun way to relax and enjoy the scenery with good company. 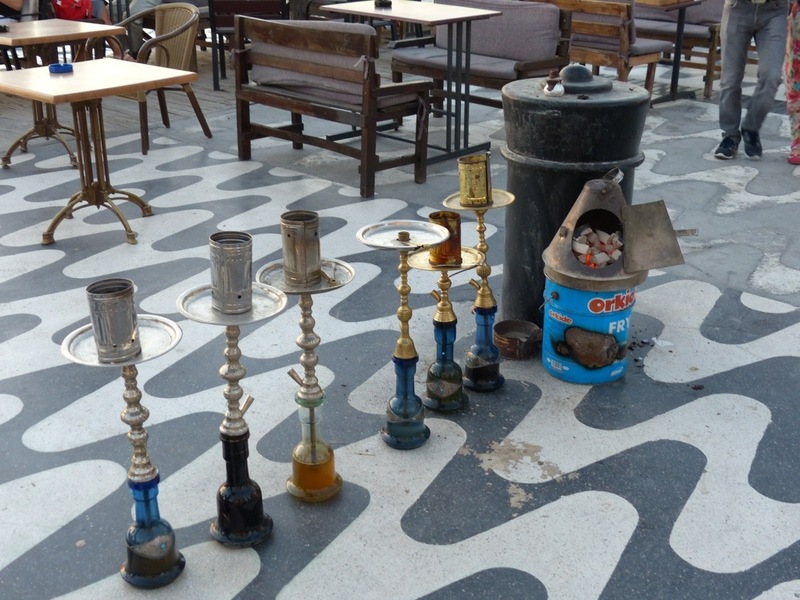 Most of the cafes also offered hookahs. 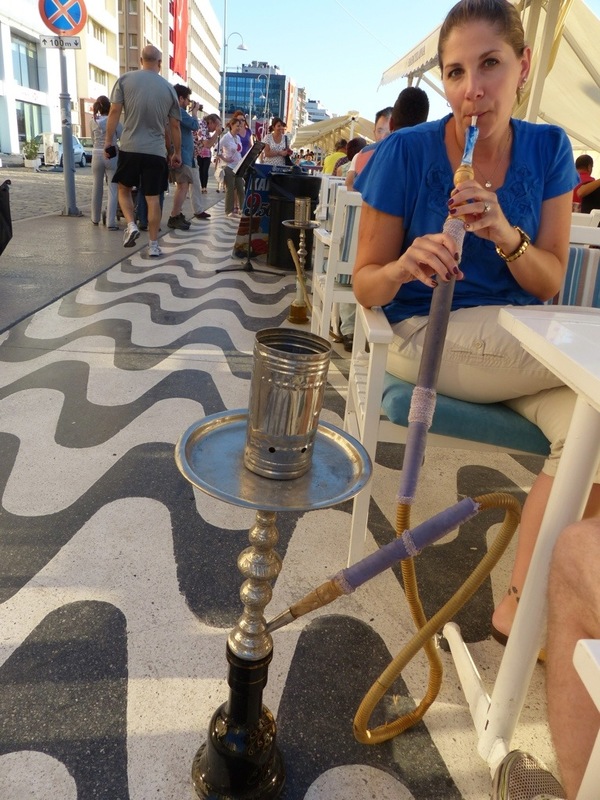 Hookahs are water pipes used to smoke flavored tobacco called shisha. I had never tried a hookah before and since I couldn’t play backgammon, I figured I would give this a try instead. The only problem was the Turks don’t call it a hookah, as we so ignorantly assumed they would, so trying to order one was a bit of a challenge. But our waiter finally figured out what I was trying to order and flipped the menu open to the nargile (NAR-gee-lay) options. I decided to try the vanilla shisha and I must say I quite enjoyed it! Posted on September 19, 2013 by Dayna B. 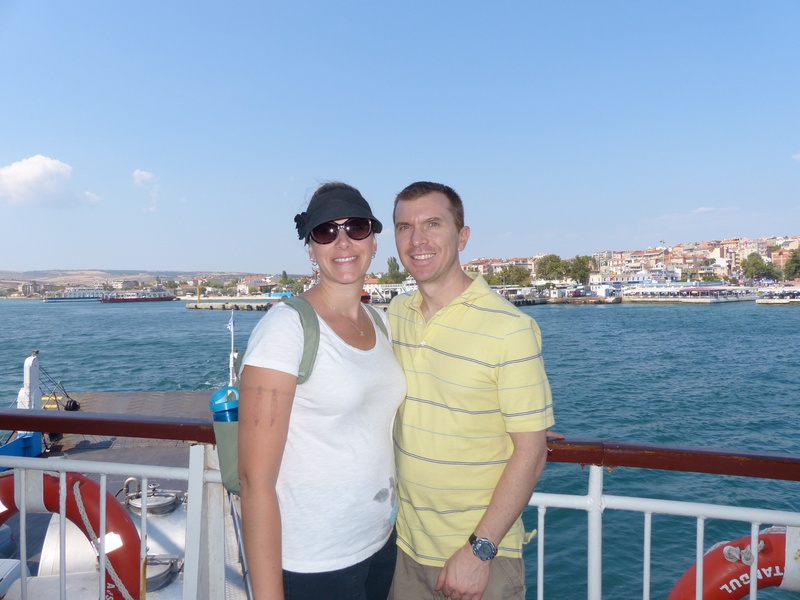 After visiting Troy, our first overnight stay in Asia was in the port town of Çanakkale (pronounced Cha-knock-ka-lay). 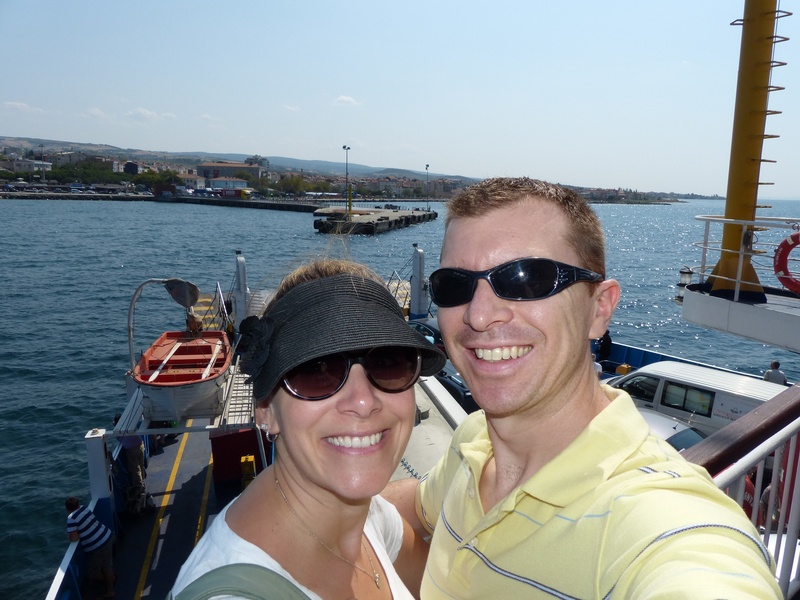 We stayed at the Hotel Akol which was right across the street from the waterfront and we even lucked out and got a room overlooking the water. 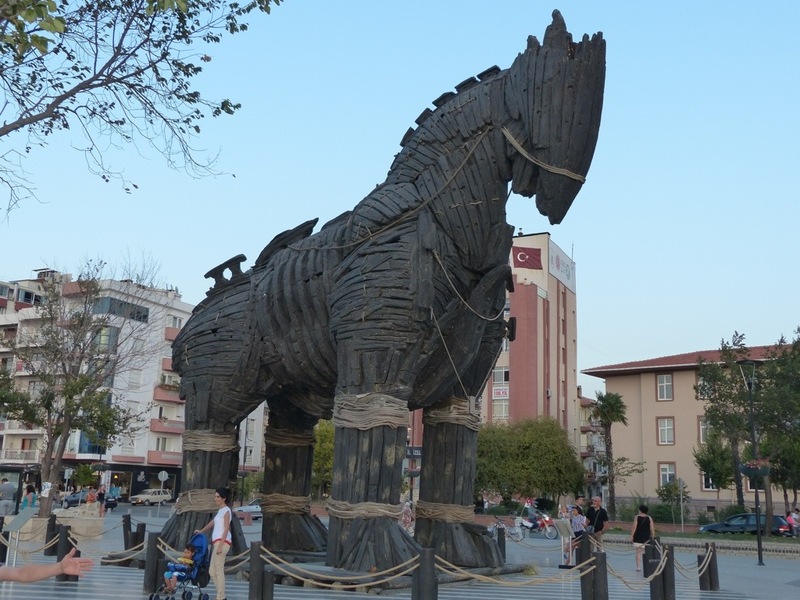 Çanakkale is the nearest major town to the ancient city of Troy, but even then, I wasn’t expecting it to have its very own Trojan Horse! 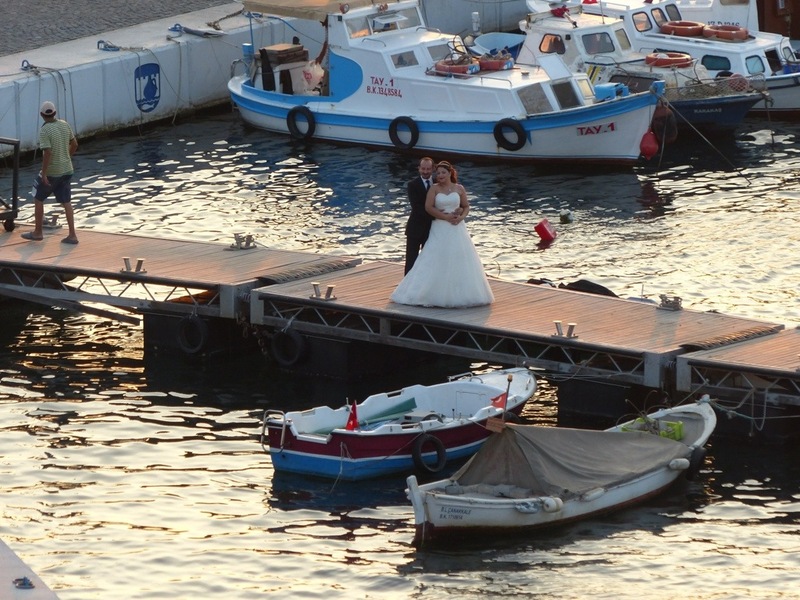 But there it was, smack dab in the middle of the busy waterfront walkway. If you ask me (which you haven’t, but I’m telling you anyway!) 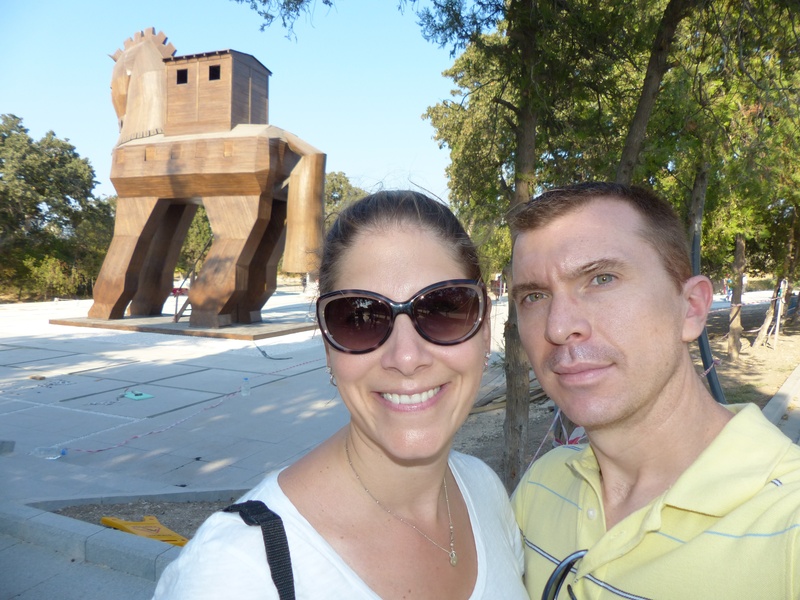 this Trojan Horse is way cooler than the cheesy rendition at Troy itself! 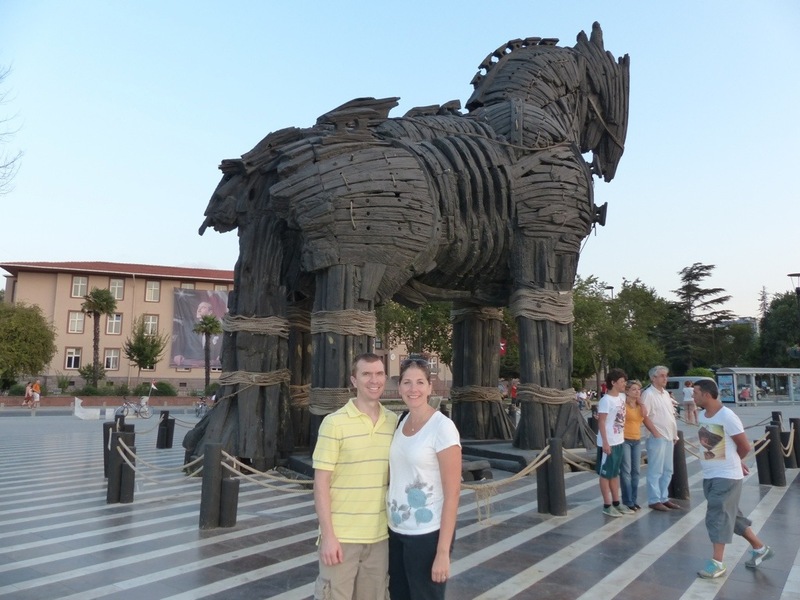 Çanakkale’s horse is the actual model used from the blockbuster movie Troy. That’s right ladies…Brad Pitt touched this one! The model was gifted to the city in 2004. 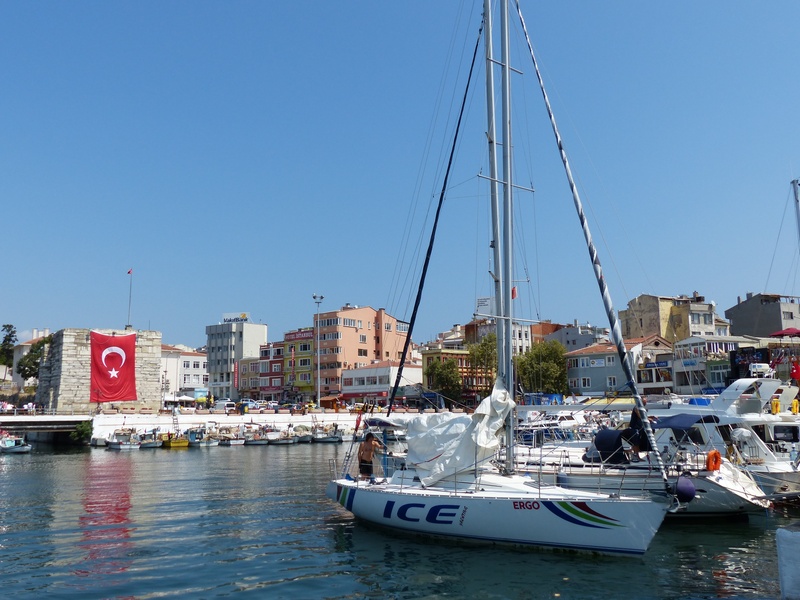 Çanakkale lies along the coast at the narrowest point of the Dardanelles Strait. 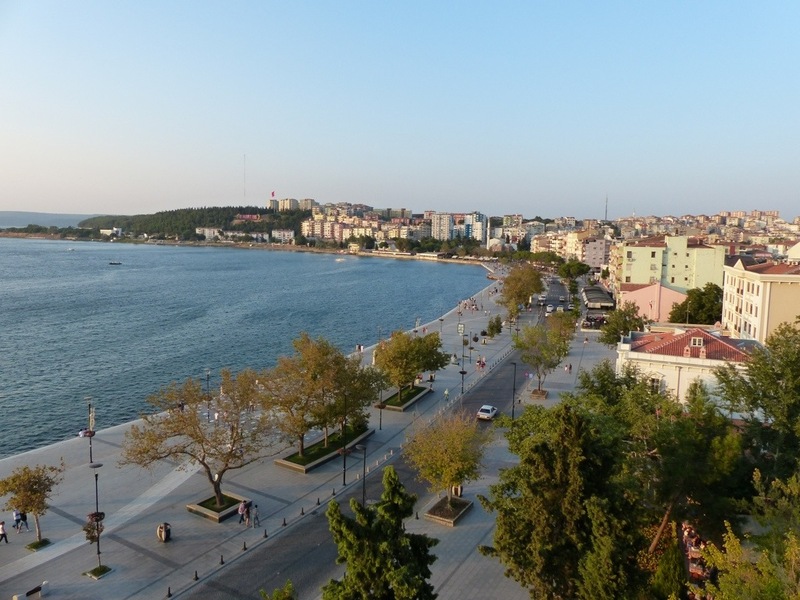 The lively waterfront in this quaint town is filled with street vendors, happenin’ bars and restaurants, and is the perfect place for people watching. We even happened upon a bride and groom. Posted on September 18, 2013 by Dayna B. 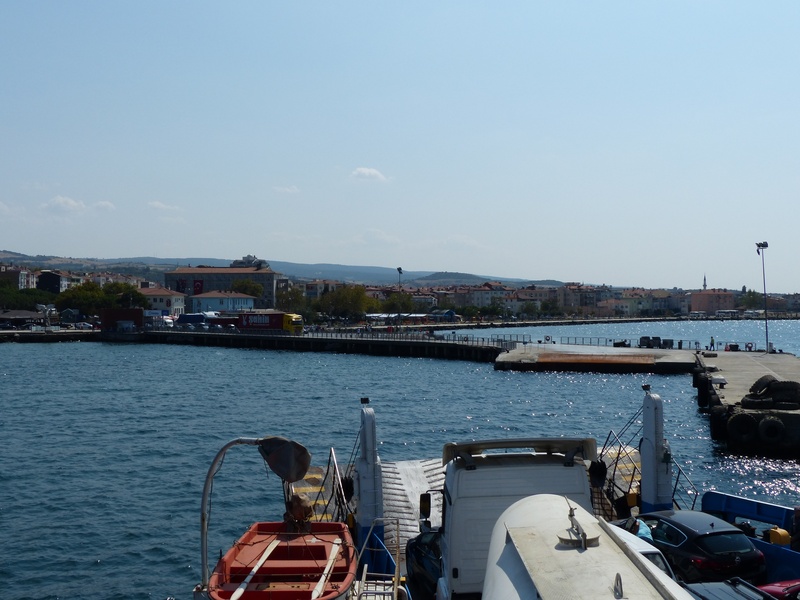 Our first stop after crossing into Asia was Troy, or the area that they believe to be Troy. 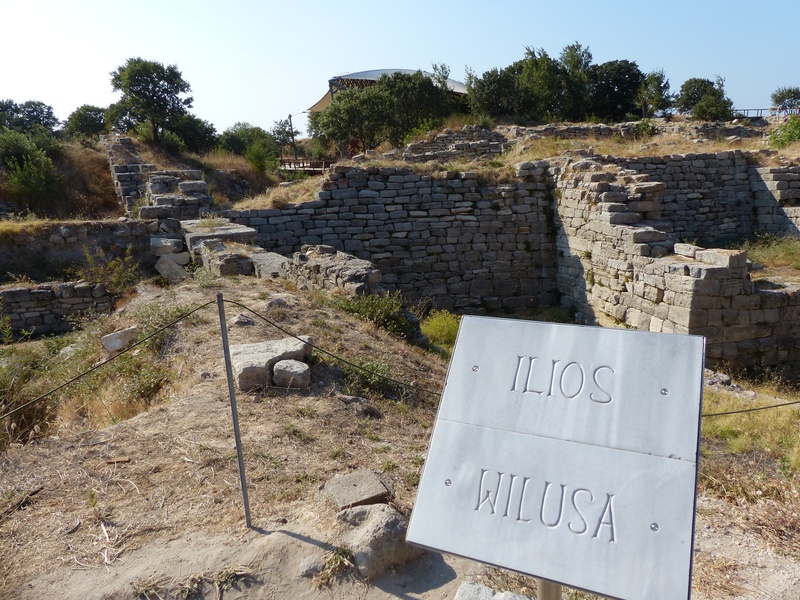 While these ruins are generally identified as the site of the legendary Trojan War, the evidence is not 100% conclusive. 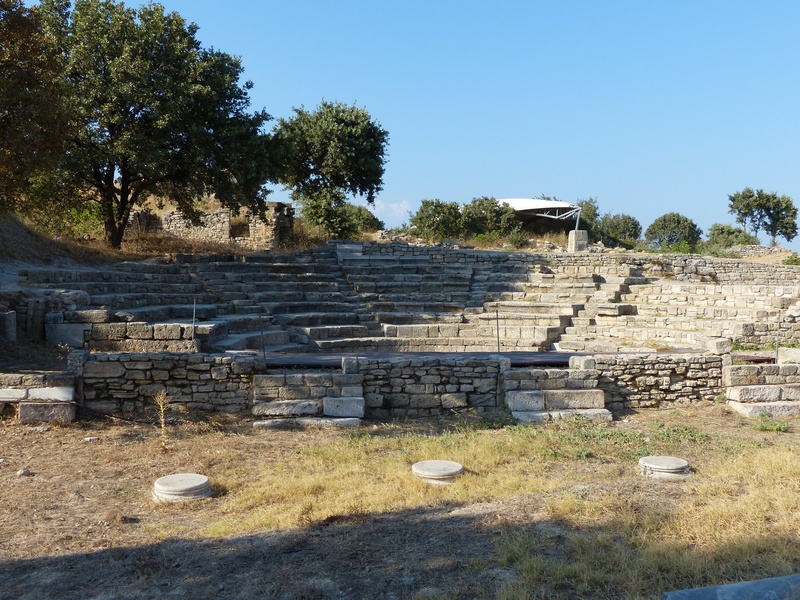 However, most historians and archeologists are convinced that this was in fact the ancient city of Troy, which apparently was enough for this area to be added to the UNESCO World Heritage List in 1998. Sounds good enough for me! Let’s call this place Troy! 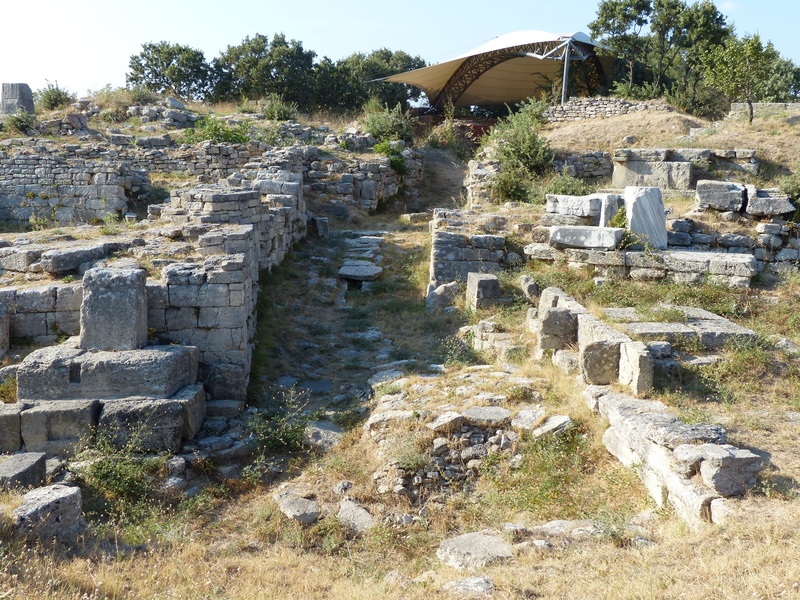 According to the Iliad, the ancient city of Troy sat atop a hill, across the plain of the River Scamander. But today, Troy is about 3 miles from any body of water (you can see the water if you look closely at the picture below). Historians believe that 3,000 years ago, the field shown below was actually a large bay that has since been filled with sediment. 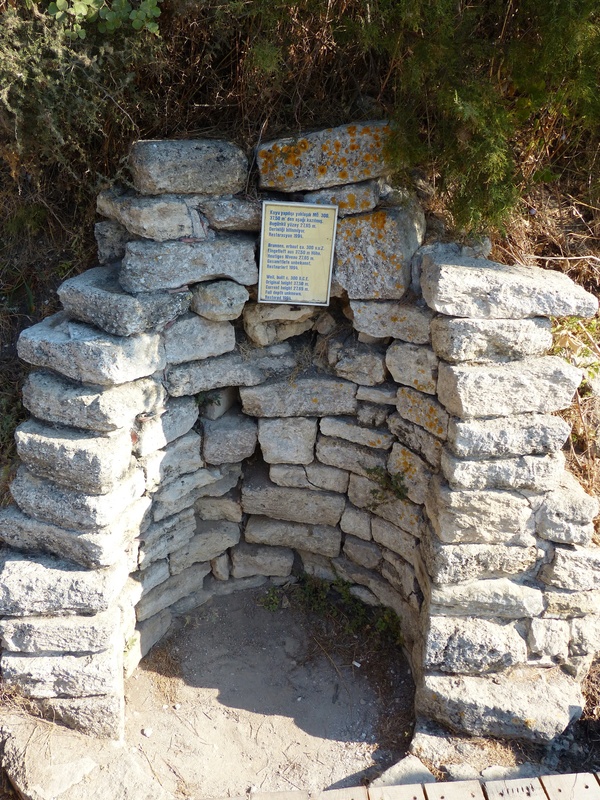 Geological evidence supports that this location would have matched Homer’s geographical description of Troy. 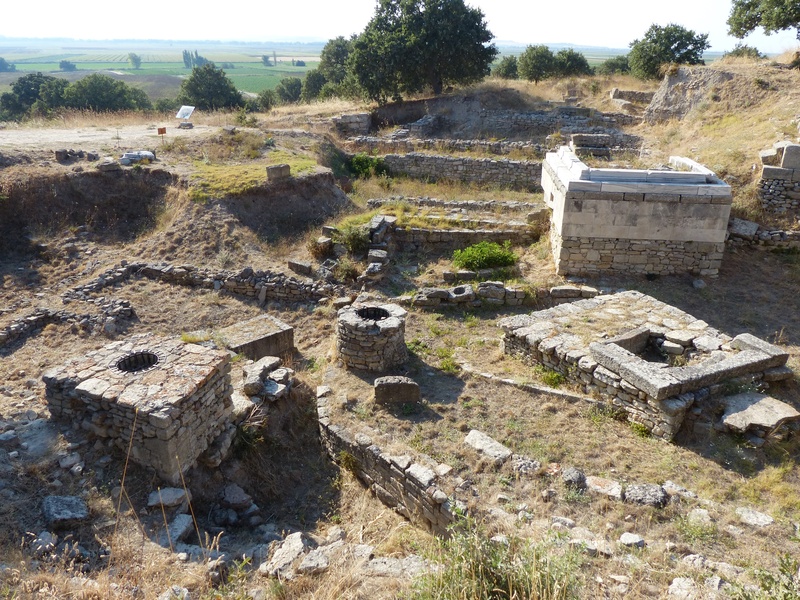 Troy was a city that was continually built upon and expanded. 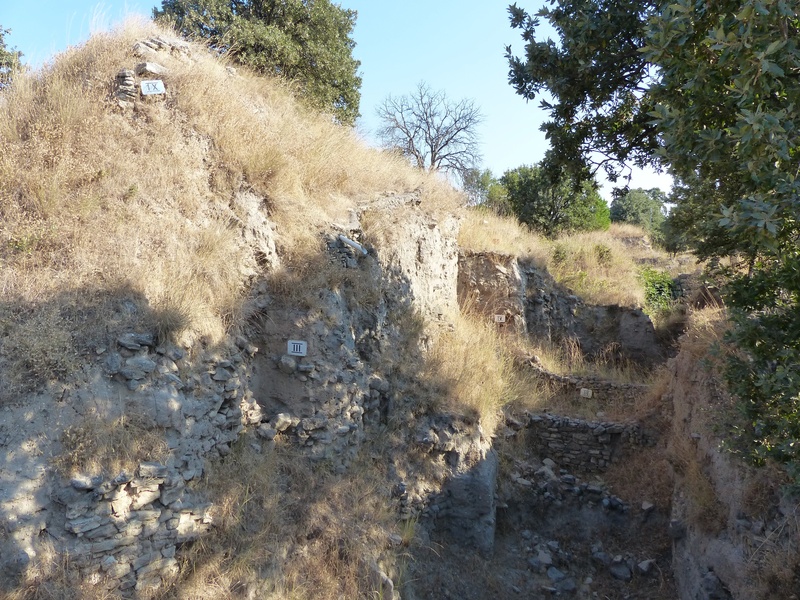 For this reason, archeologists have uncovered several “layers” of Troy. 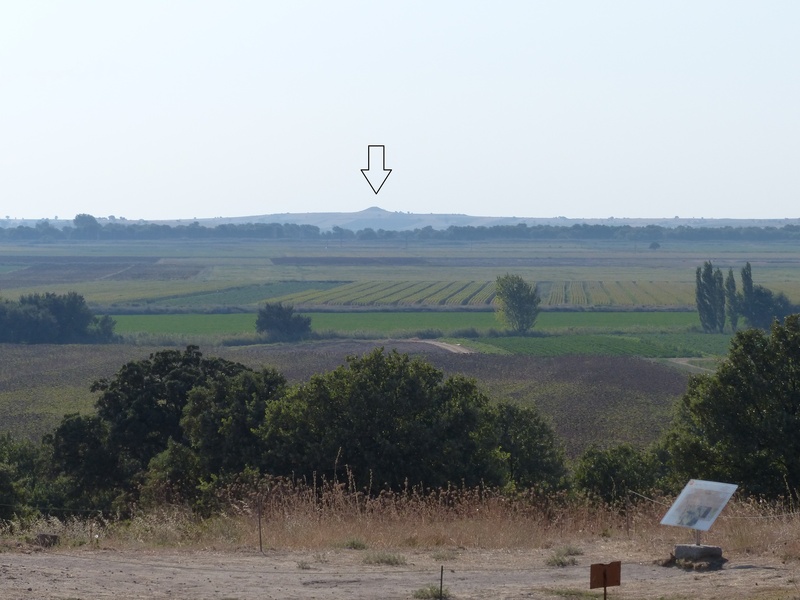 These layers are called Troy I – Troy IX and they cover the periods of 3,000 BC – 500 AD. 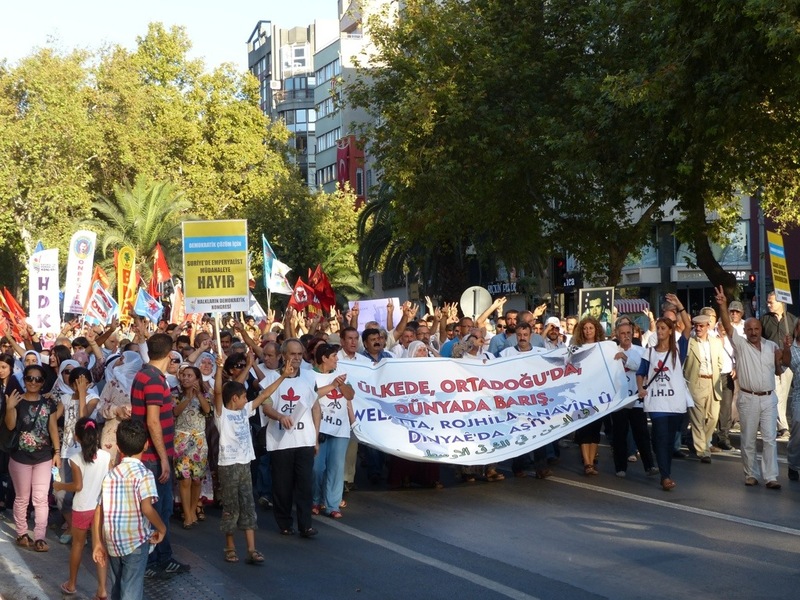 You can see placards in the picture below marking different layers of the ancient city. 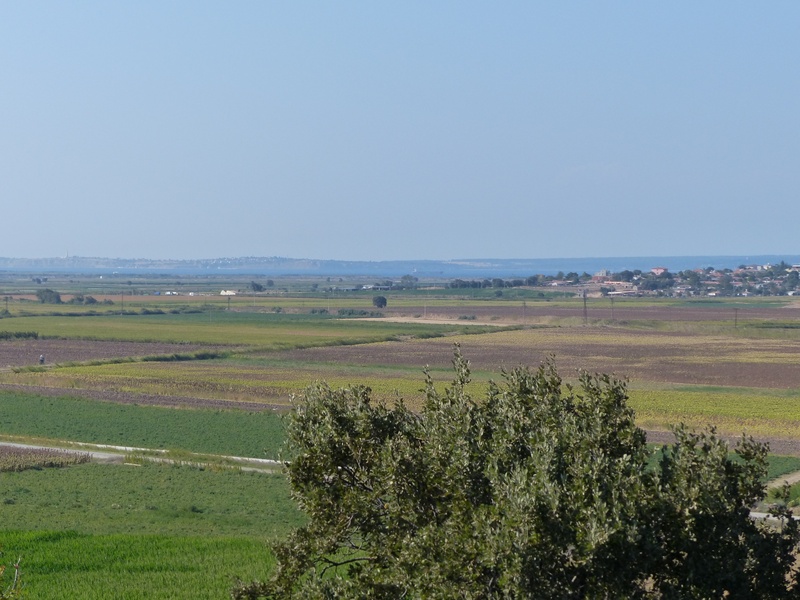 Troy VII (1300-1200 BC) is the layer associated with Homer’s story and the Trojan War. 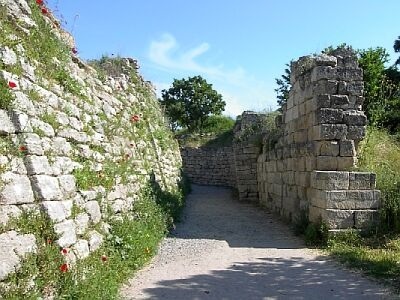 The picture of the wall below is a part of Troy VII and a likely site of the Trojan War. Our tour guide pointed out that the lower portion of the wall was designed with a slight slant to make it appear like it would be easy to climb. But towards the top of the wall, the slant disappears leaving potential wall jumpers at the mercy of the Trojans. 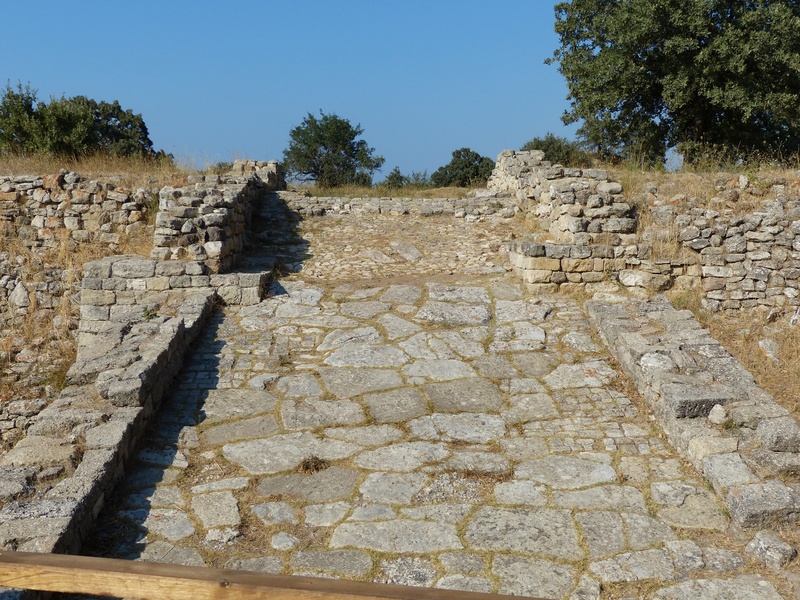 Our guide informed us the Trojans would pour boiling oil onto invaders and then light them on fire! Scalded Spartan, anyone? Not convinced this is Troy? 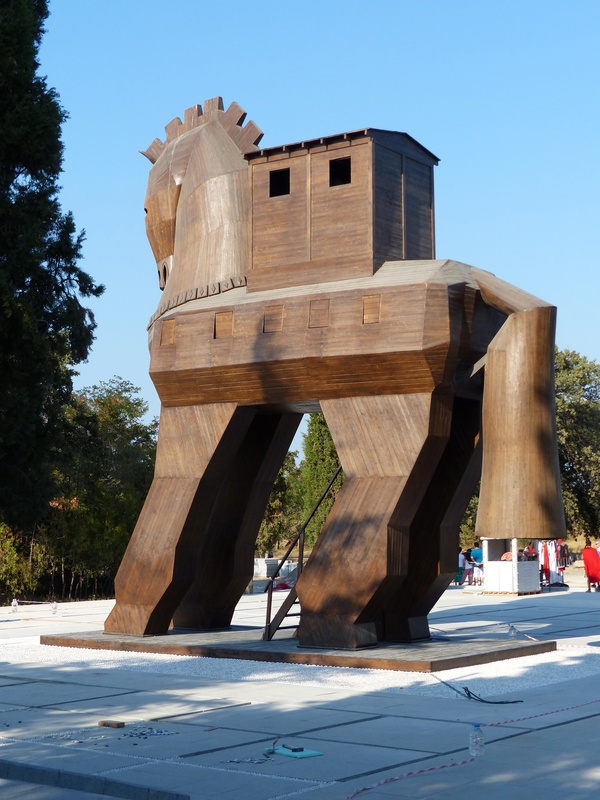 Well surely the placement of this Trojan Horse replica will be the only remaining proof you need! 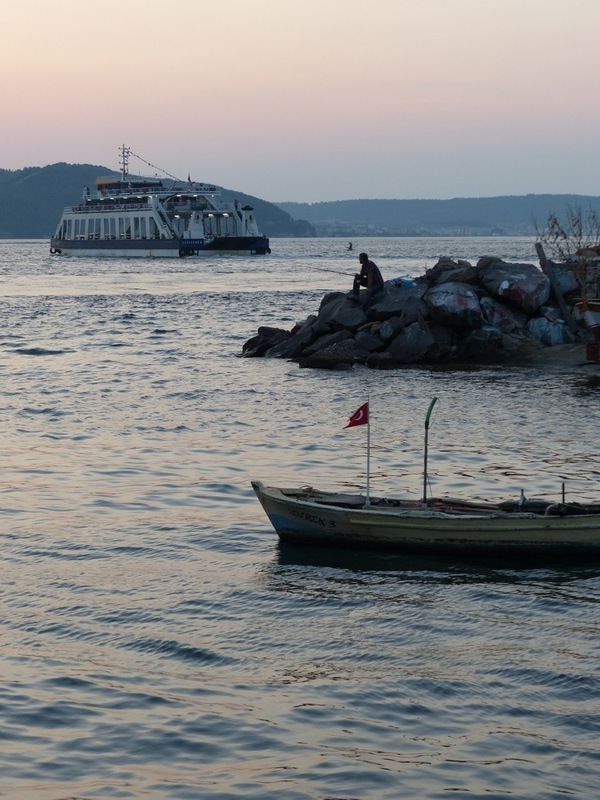 Turkey’s geography is interesting because it spans two continents. The northwest corner of the country is in Europe, but the vast majority of the land is in Asia. 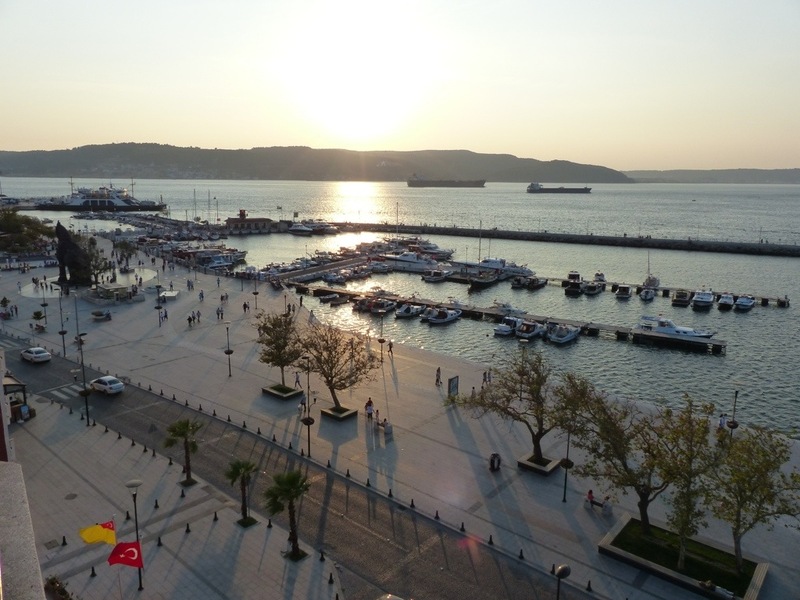 The continents are separated by the Sea of Marmara, the Bosphorus Strait, and the Dardanelles Strait. 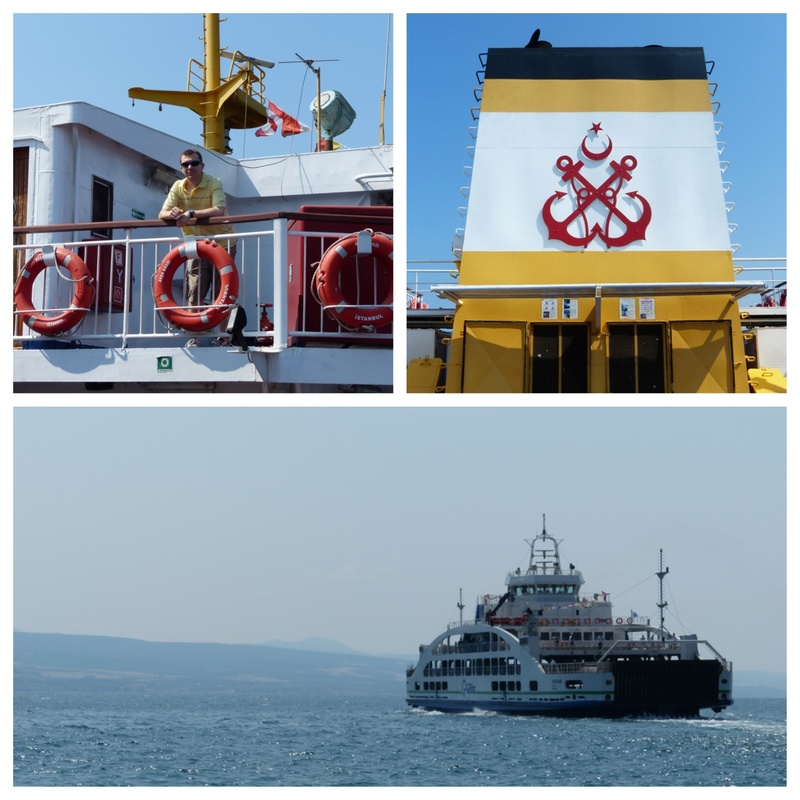 The Bosphorus Strait feeds into the Black Sea in the north and the Dardanelles feeds into the Aegean Sea in the west. 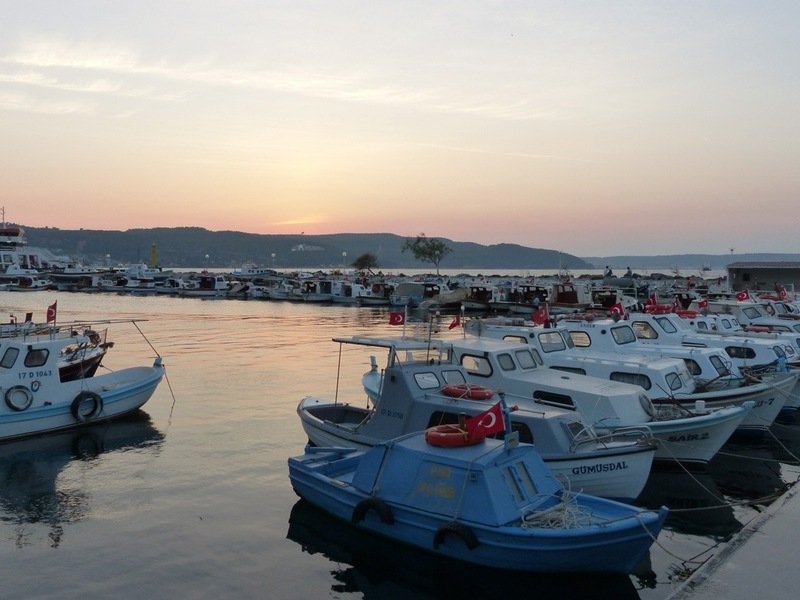 Despite the small portion of land that is actually located in Europe, Turkey is a member of the European Union. 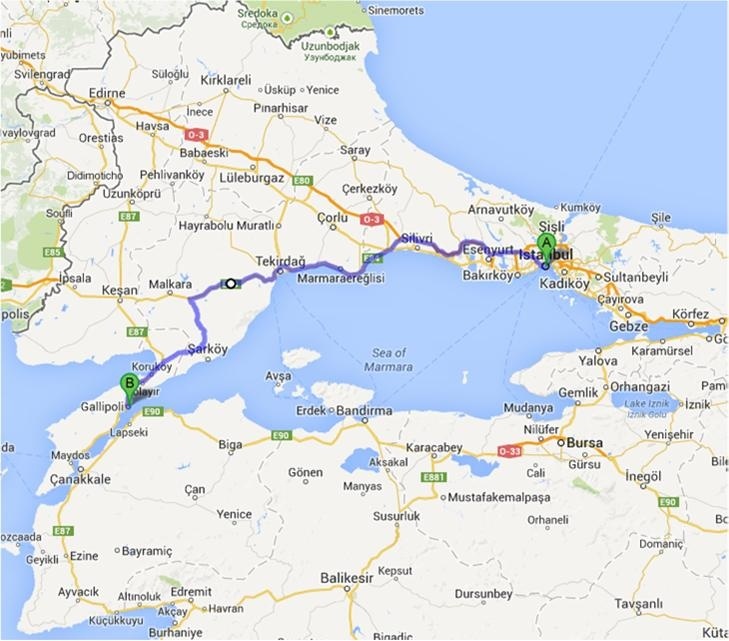 Our tour bus departed Istanbul and headed west towards Gelibolu (spelled differently on the map below). 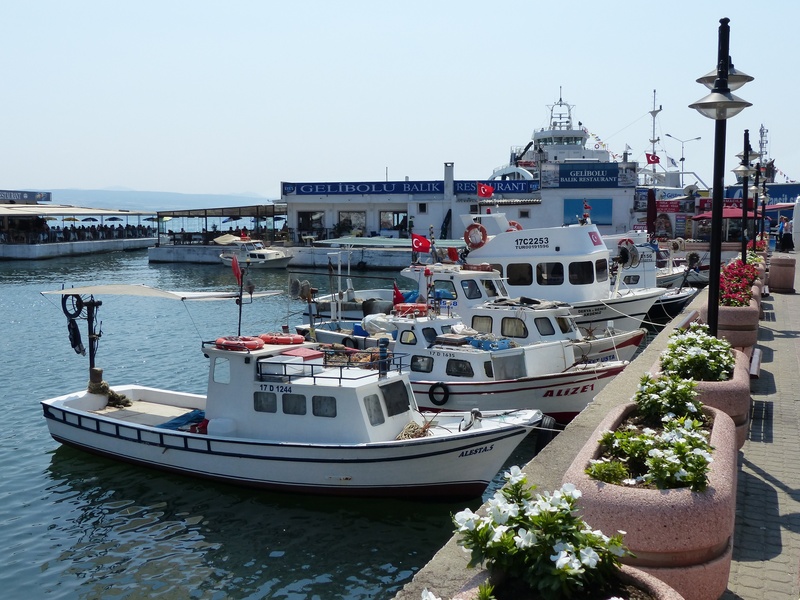 Gelibolu is a quaint little port town on the European side of the Dardanelles. This would be our launch point to cross over to Asia. 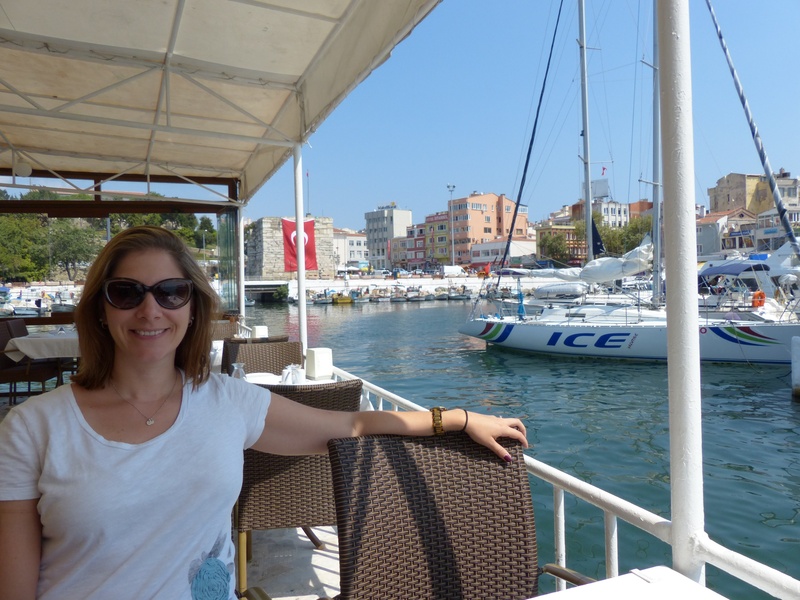 But first, we had time for a lovely lunch at a waterside restaurant. 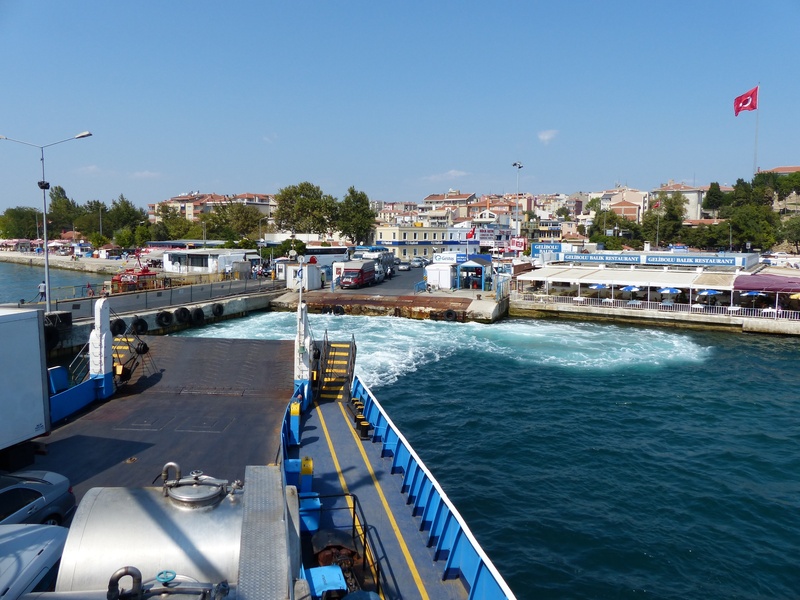 After lunch, our tour bus drove onto the ferry and we were ready to make our voyage (about 20 minutes) to Asia! Posted on September 13, 2013 by Dayna B. 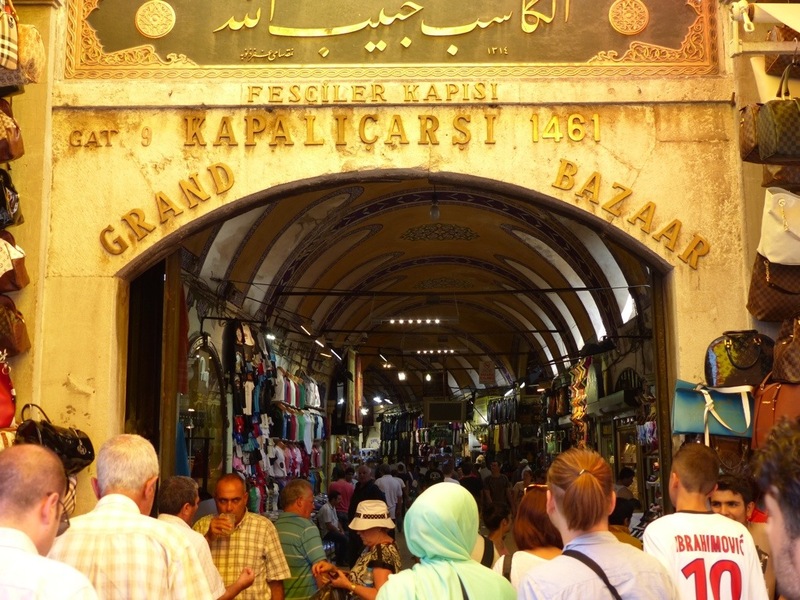 The Grand Bazaar is one of the oldest and largest covered markets in the world! 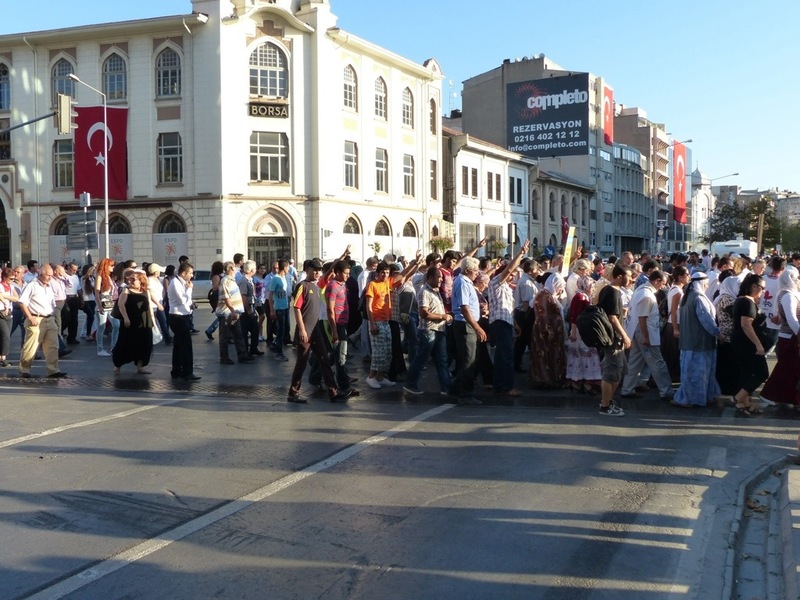 It is comprised of over 3,000 shops spanning 61 covered streets. 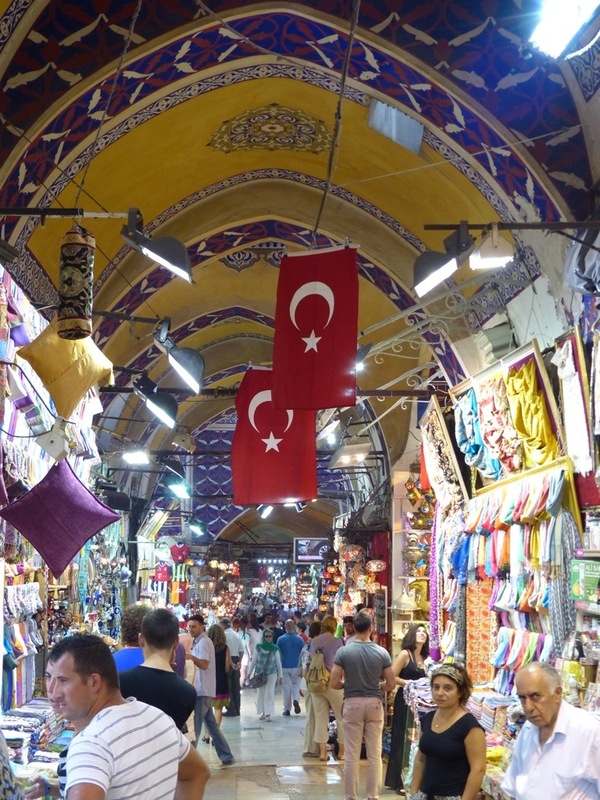 The Grand Bazaar used to be where the locals did all of their shopping, but today it is basically a tourist trap attracting up to 400,000 visitors a day. But it is a fabulous tourist trap! 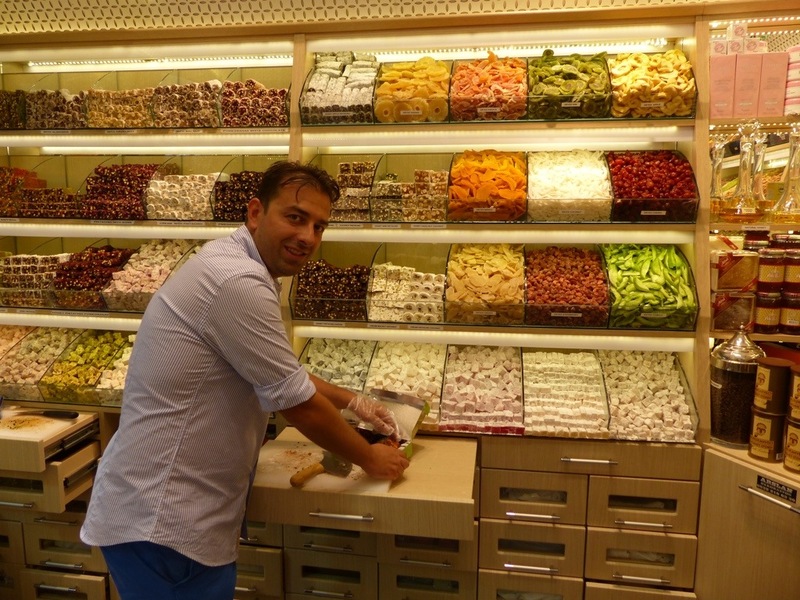 As soon as you enter, you are overwhelmed with sights, sounds, smells and even tastes (as shop owners quickly offer you samples of their tasty Turkish Delight!). You can probably find better deals elsewhere, but it is an experience that you shouldn’t pass up. 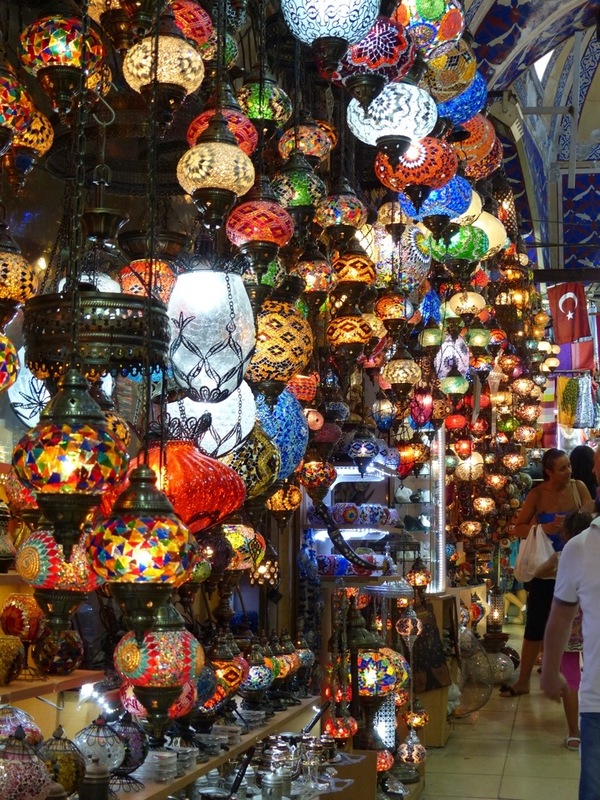 Even if you don’t plan to buy anything, it is fun just to walk around and take it all in. 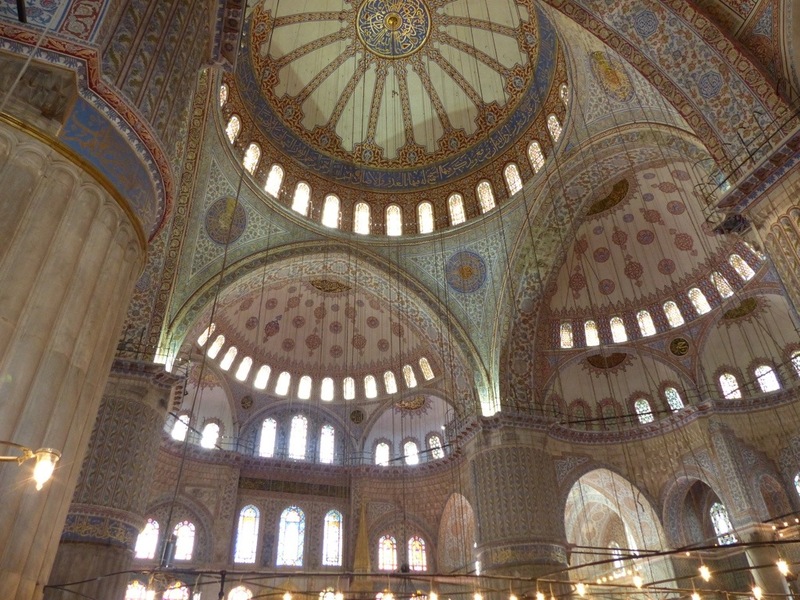 The place is huge and you could easily get lost inside. Rob and I barely scratched the surface, but I feel like we got a good taste of what the bazaar had to offer. 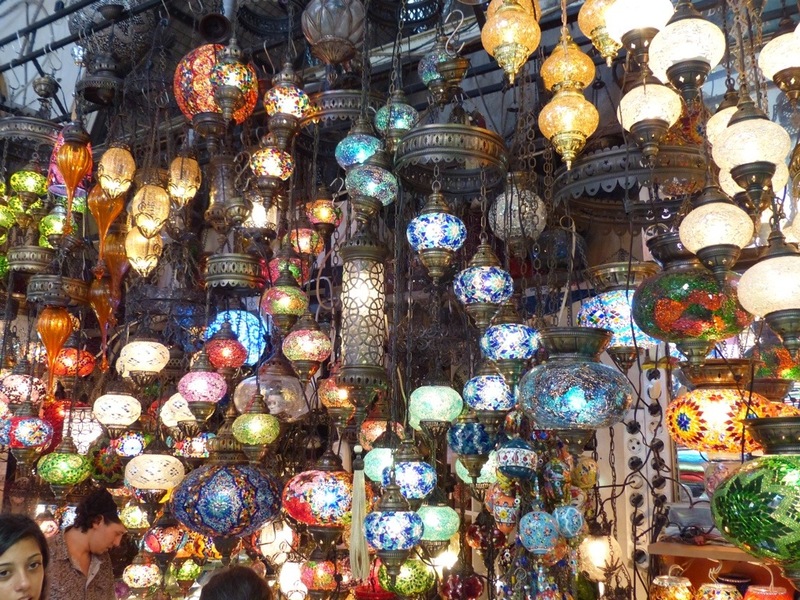 One of my favorite parts was all of the lamp shops. 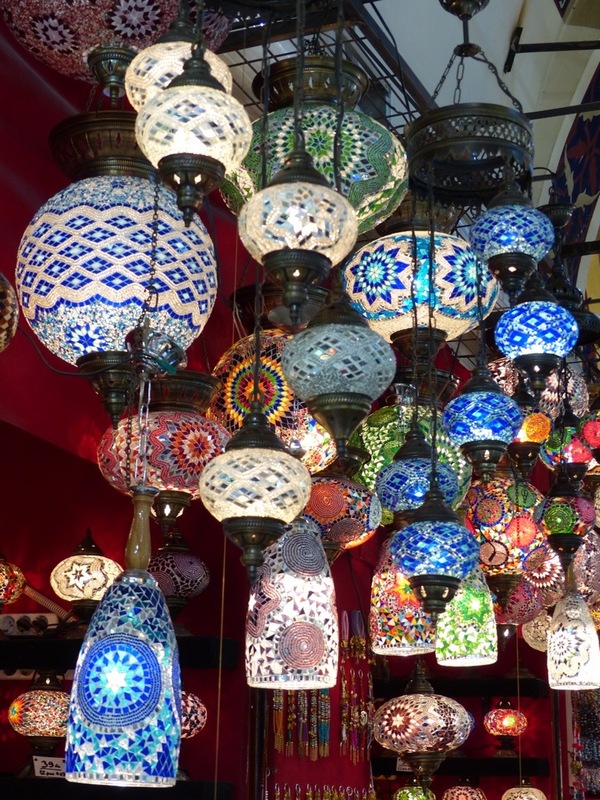 I thought these mosaic lamps were absolutely beautiful! 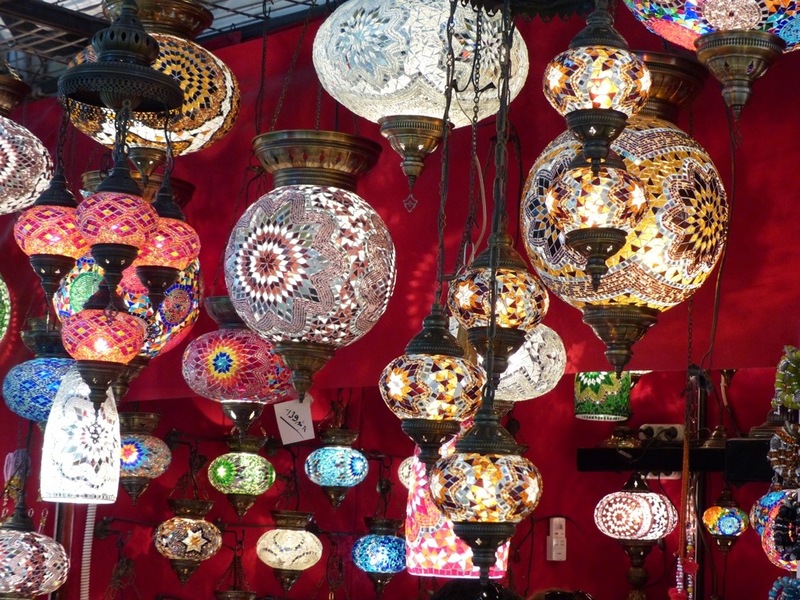 I didn’t end up buying one, but I definitely enjoyed looking at them (and apparently photographing them as Rob harassed me for taking yet another lamp photo over and over again!). 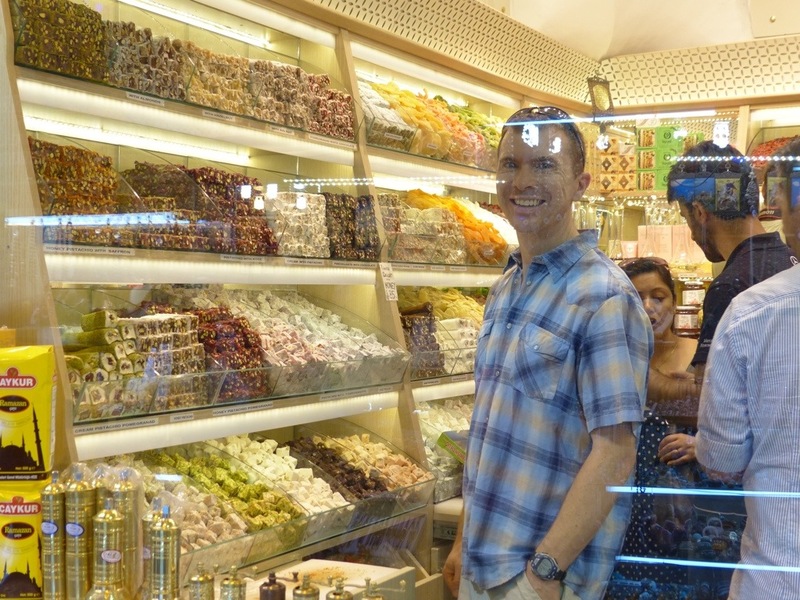 It is quite easy to get sucked into the shops that sell Turkish Delight. This stuff is well deserving of its name (DELIGHTFUL!). Clearly, Rob is the proverbial “kid in a candy shop!” (The shop owner was smiling because Rob actually paid him full price without even an attempt to barter!) Rob’s shopping privileges were put on probation after that. 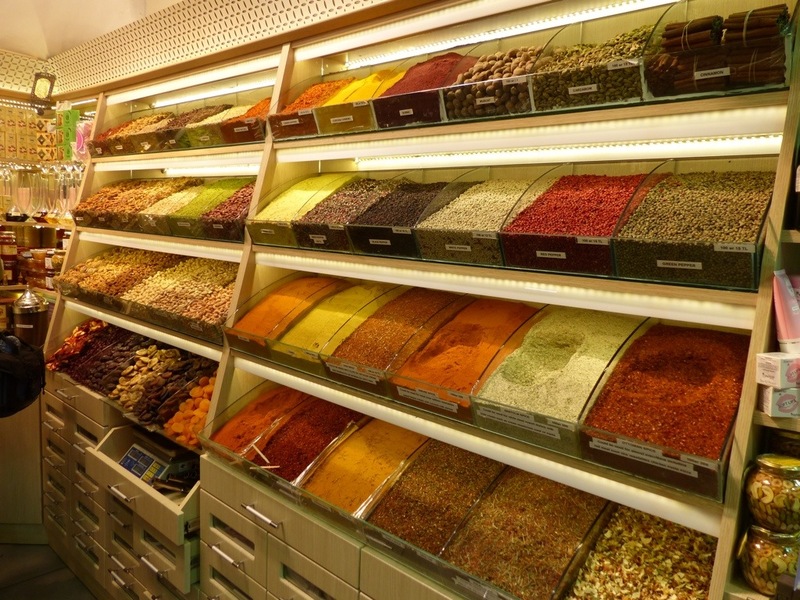 The bazaar is filled with fabulous aromas from a wide variety of spices and teas. 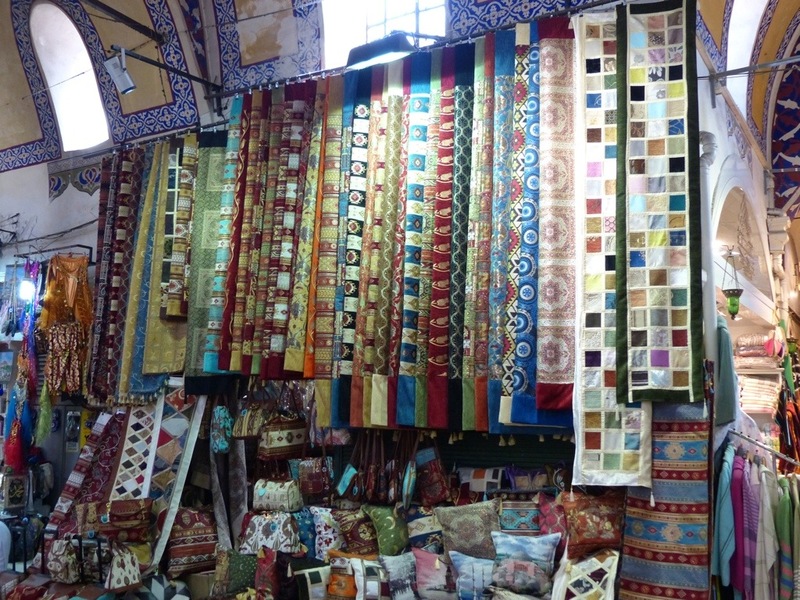 We didn’t buy either, but it made for some colorful photography. I could have easily spent a lot more time at the bazaar, but my patrol partner has a much shorter attention span when it comes to shopping. All in all, he was a really good sport and we picked up a few nice things. Posted on September 12, 2013 by Dayna B. 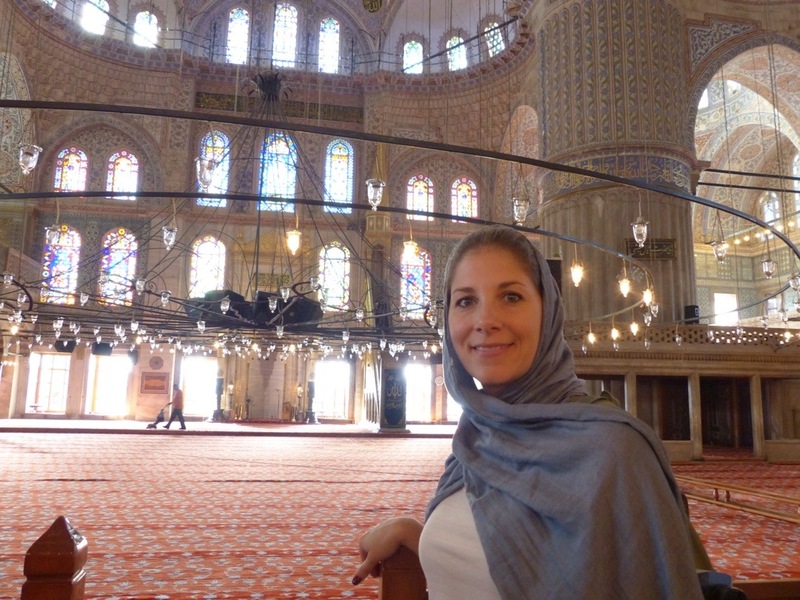 No visit to Istanbul is complete without seeing the Blue Mosque. 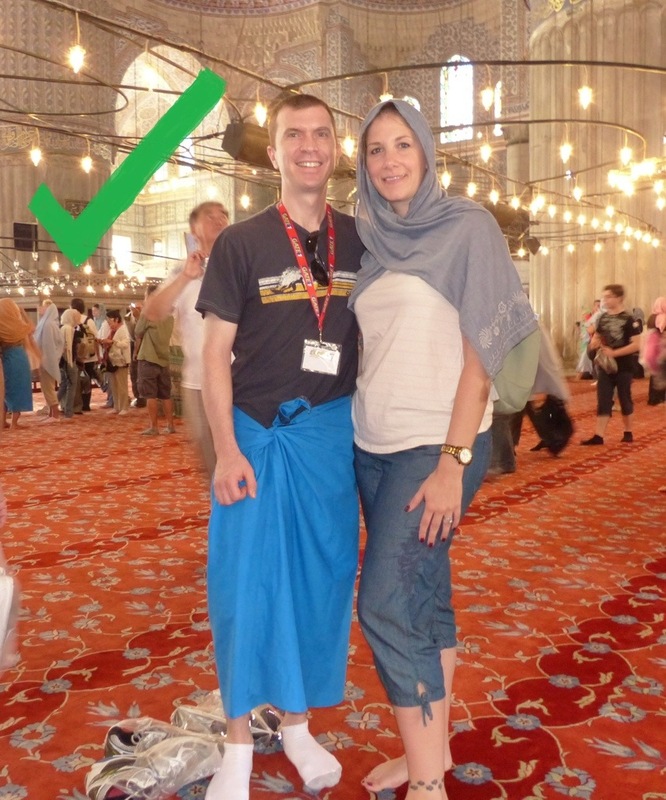 However, in order to enter the mosque, you must be appropriately dressed. Notice how Rob’s attire exactly matched the “do not wear this” column. 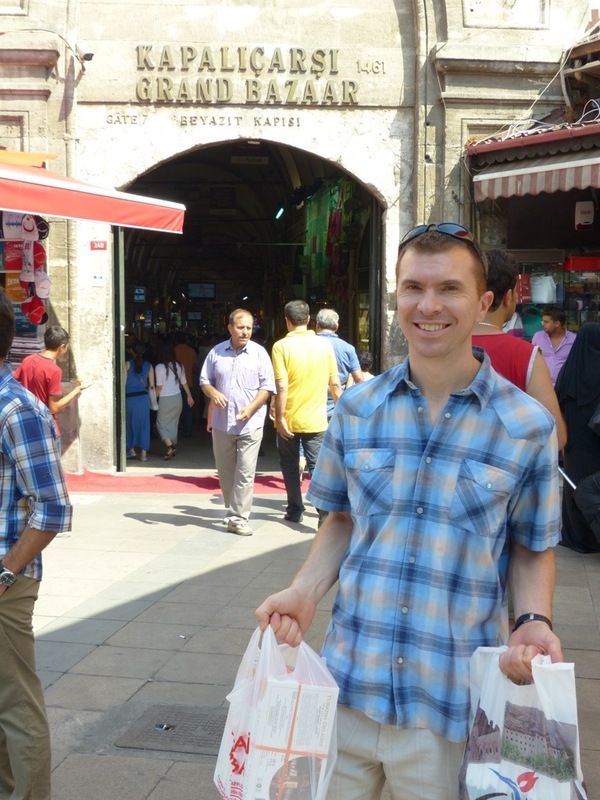 Don’t worry, Rob was still able to enter the mosque. But not until he covered himself up appropriately! All visitors are screened by Mosque Fashion Police (clearly not their official title) before entering to ensure that they meet the etiquette requirements. 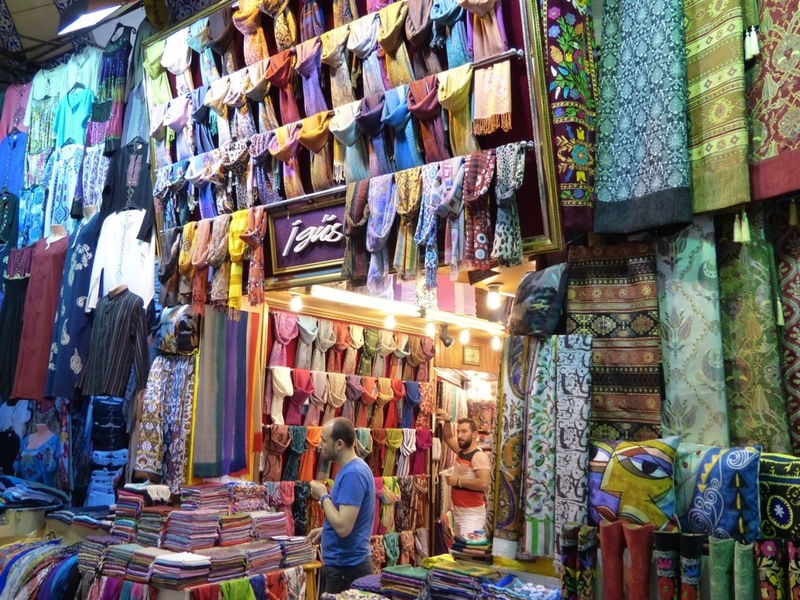 Women are provided with head scarves and men are provided with sarongs. Fortunately, I was prepared and brought my own scarf. 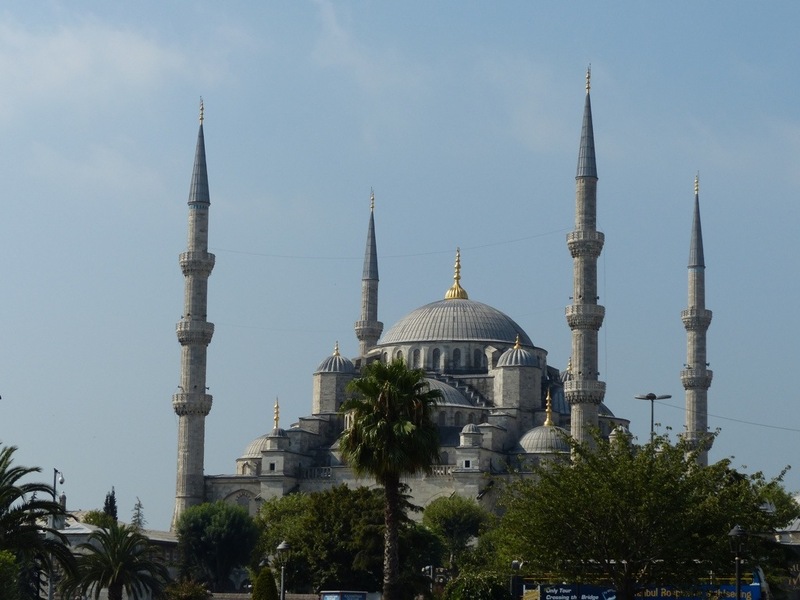 The mosque was built from 1609-1616 and it’s official name is the Sultan Ahmed Mosque, as it was built under the rule of Sultan Ahmed. 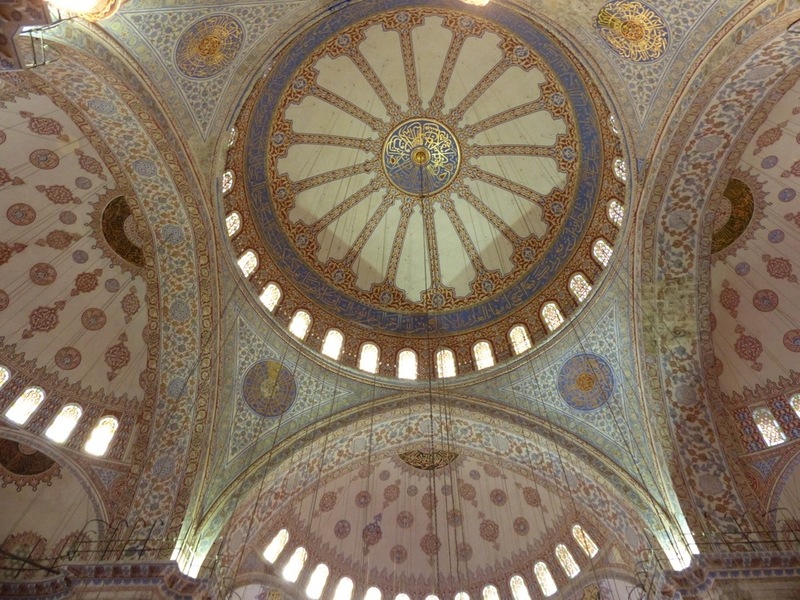 It became known (among tourists) as the Blue Mosque because of the thousands of blue tiles adorning the interior. 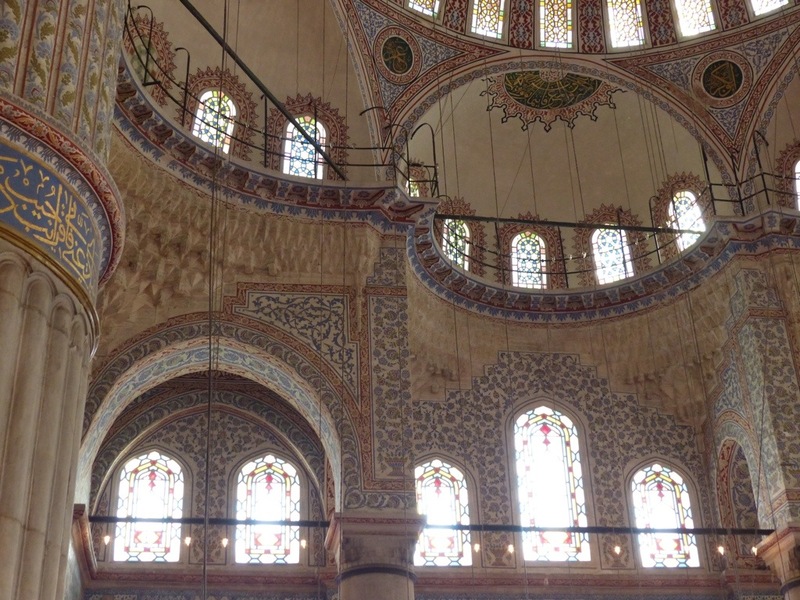 There are more than 20,000 handmade ceramic tiles depicting more than 50 different tulip designs. 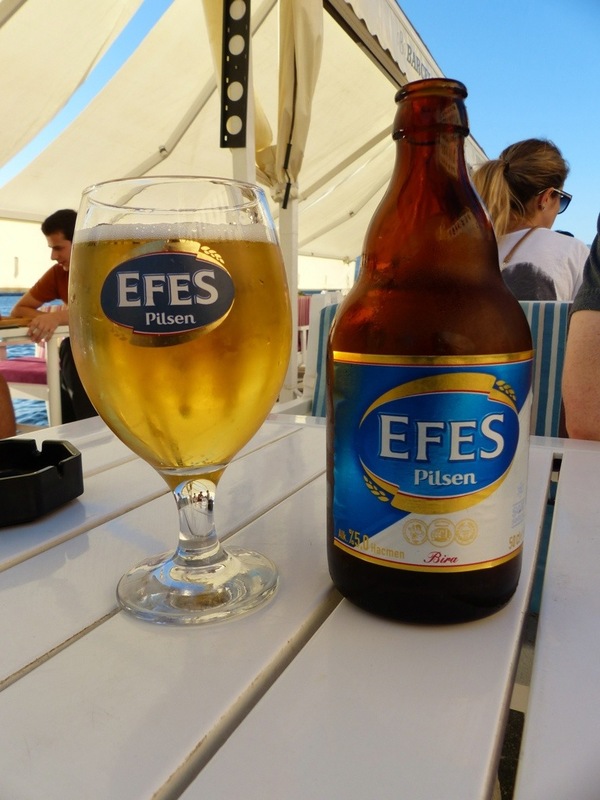 The tulip is somewhat of an unofficial symbol throughout Turkey and can be found in many different forms pretty much everywhere you look. 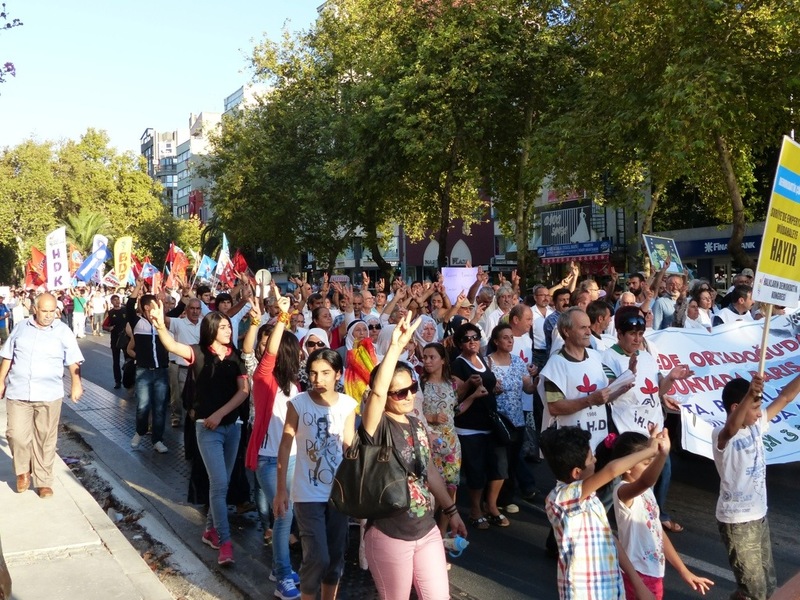 Watch out Amsterdam, Turkey wants your claim on tulips! I’m not sure if this is true or not, but our tour guide told us that Turkey actually gifted the Netherlands with tulips many years ago and essentially introduced them into the Netherlands (we both thought our tour guide made a lot of things up though, so we haven’t made a final decision on that claim as of yet). 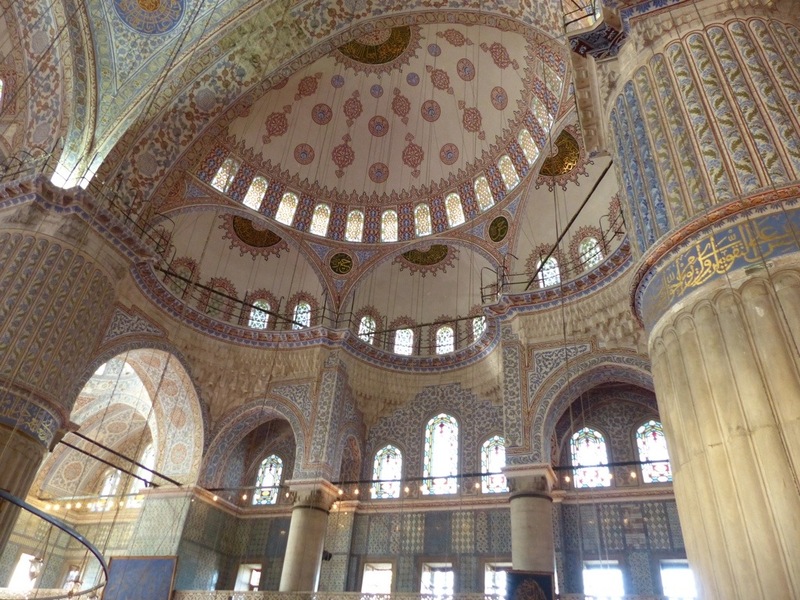 The Blue Mosque is actually a little less blue than it used to be. 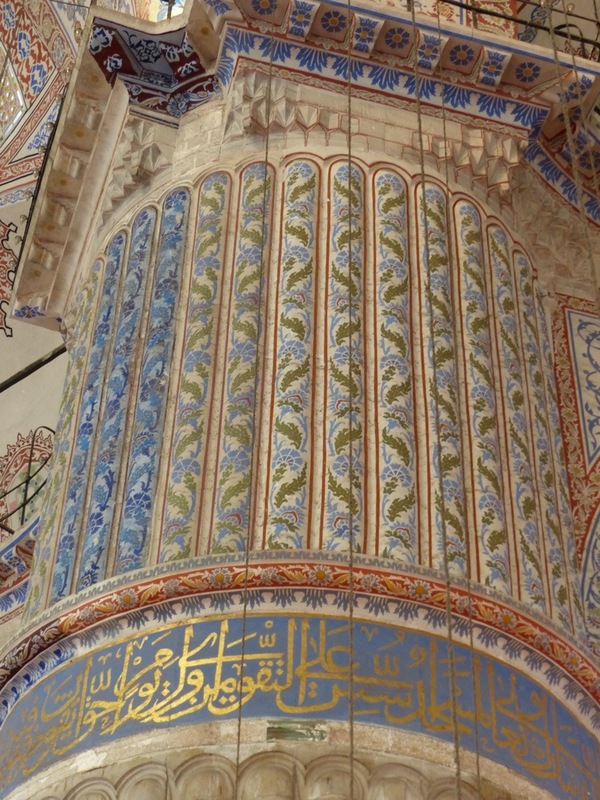 The picture below shows a small portion of this column with its original blue color. 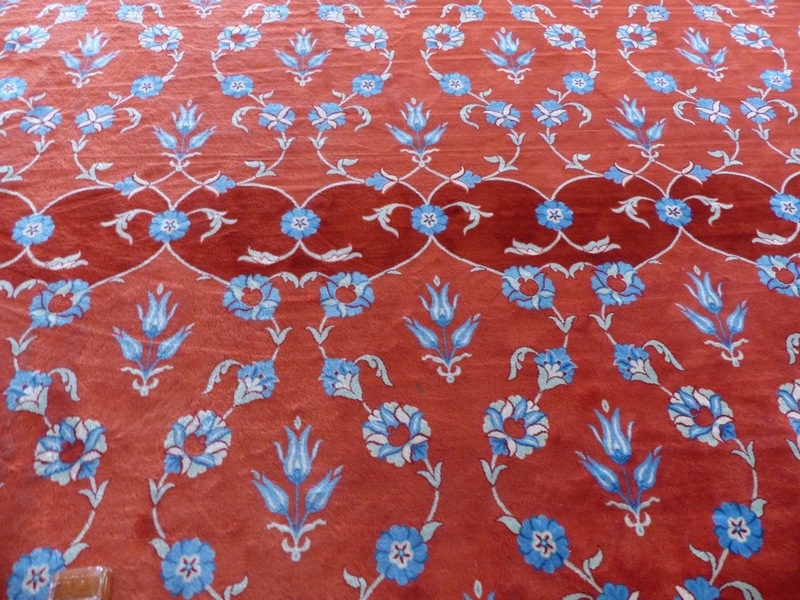 The floor of the mosque is covered by a beautiful carpet with a tulip design. 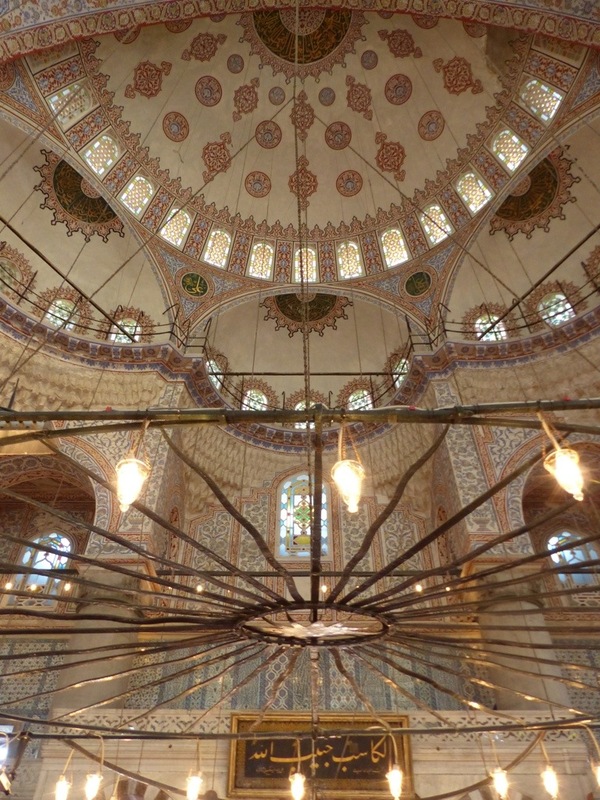 The darker area of the rug is meant to be a place marker for where the men should line up for prayer. 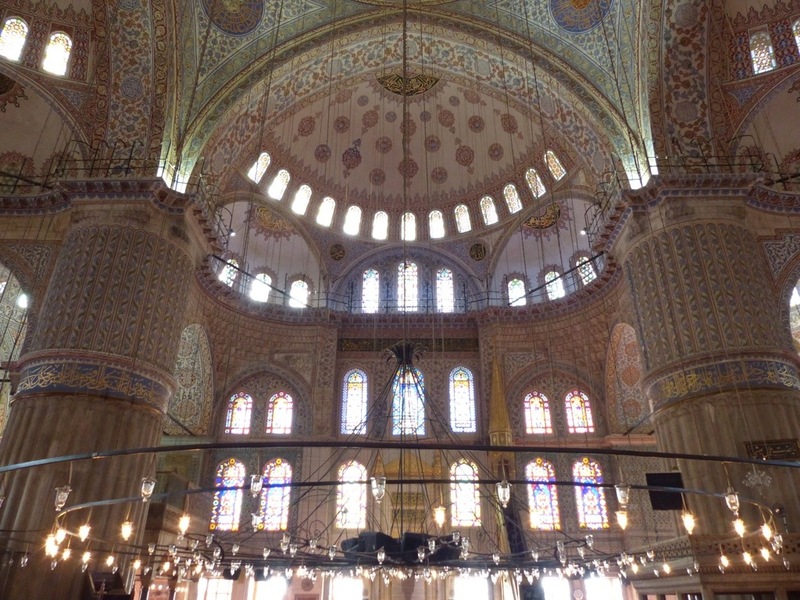 The dark portions are appropriately spaced to provide the men enough room to pray without bumping into one another. 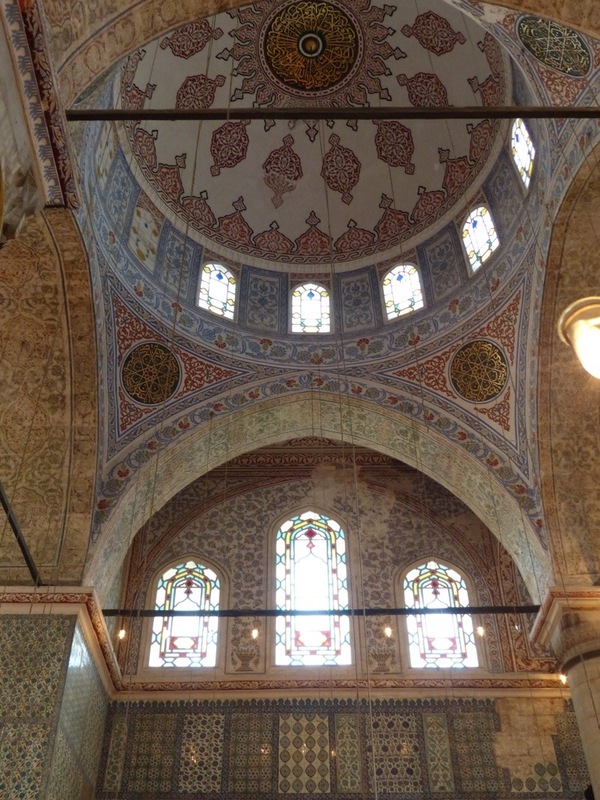 The decorations inside the mosque were absolutely stunning! 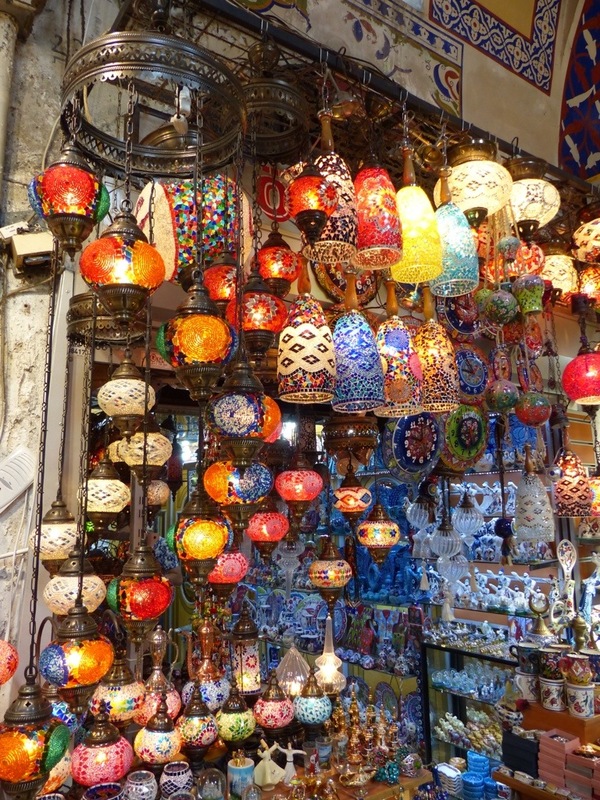 This is definitely a must-see for anyone traveling to Turkey (but of course, I’m sure you already knew that). Posted on September 11, 2013 by Dayna B. 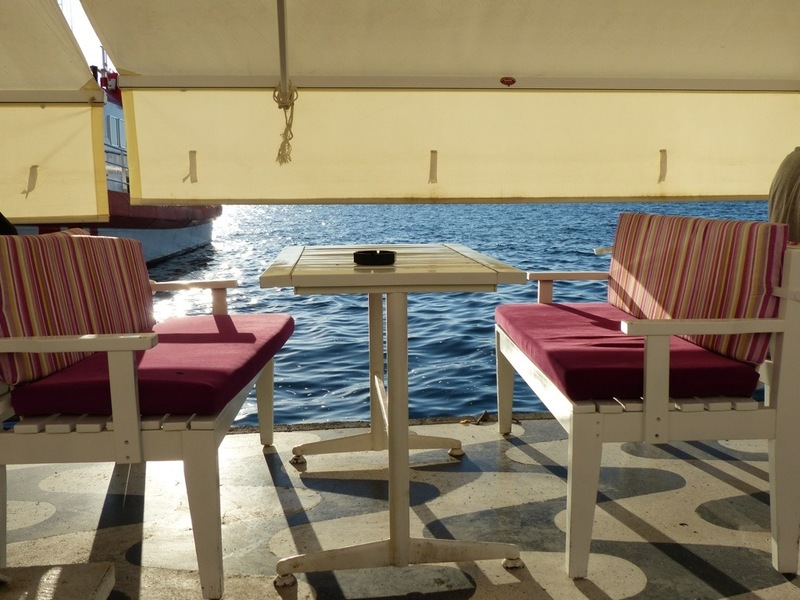 This vacation package was super affordable and there is NO way we would have been able to see as much as we did had we not booked through Gate 1. 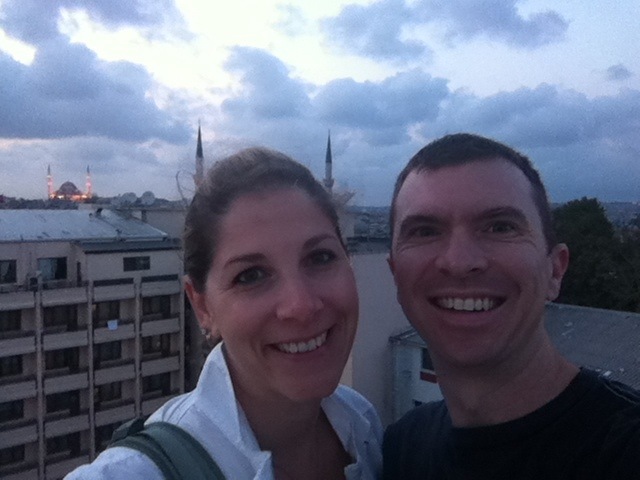 We stayed in Istanbul, Çanakkale, Izmir, Antalya, Cappadocia, and Ankara. 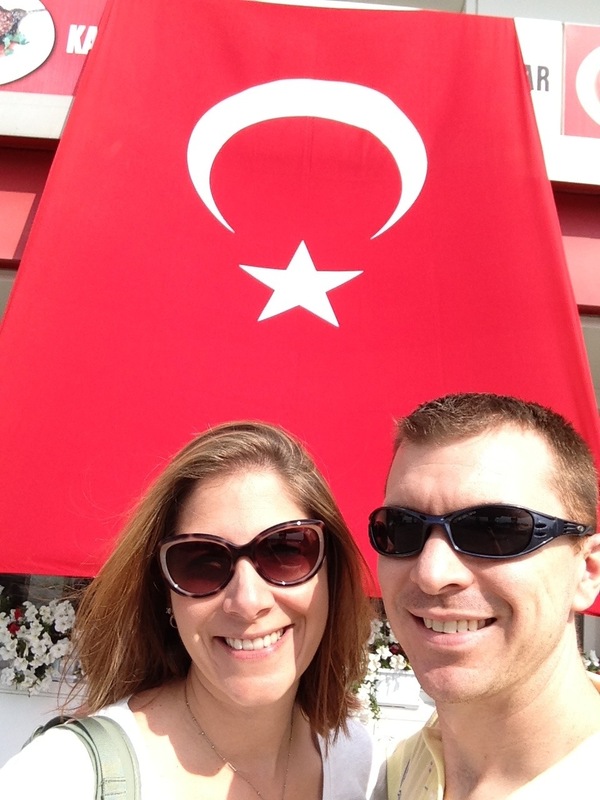 Additionally, we visited Troy, Pergamum, Ephesus and Pamukkale. 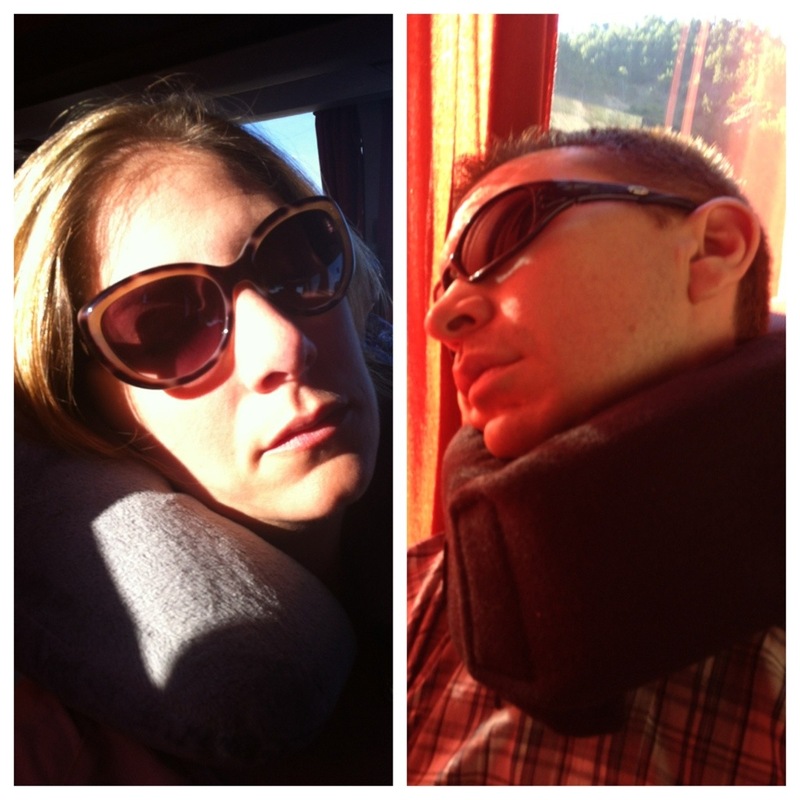 Rob and I were also extremely grateful that we didn’t have to do any of the driving. 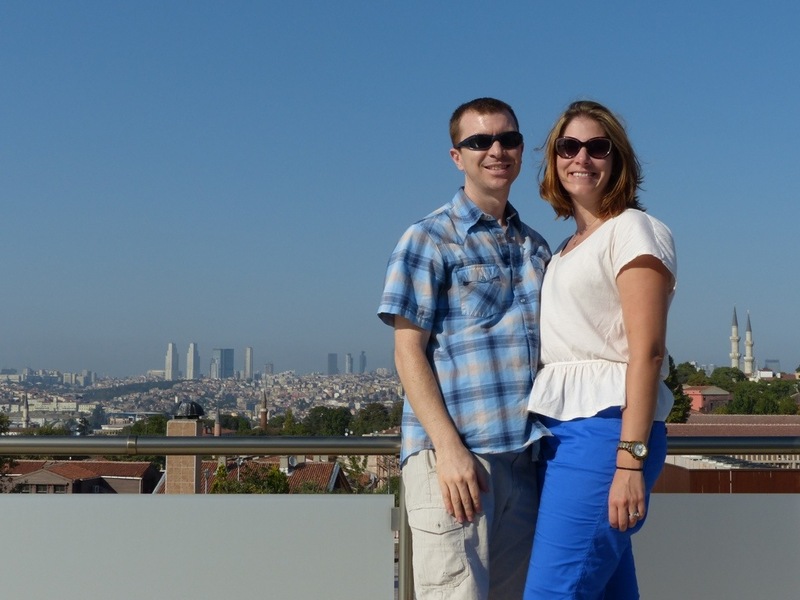 Typically, we are quite comfortable renting a car in a foreign country and navigating the streets on our own. 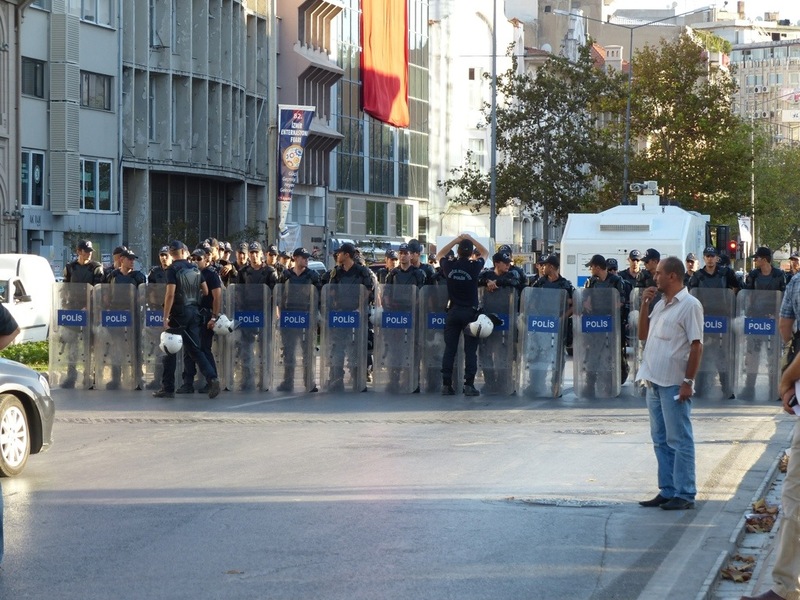 This would not have been the case in Turkey. Many thanks go out to our amazing bus driver Jason (whose name was not actually Jason, but something much longer and Turkish)! 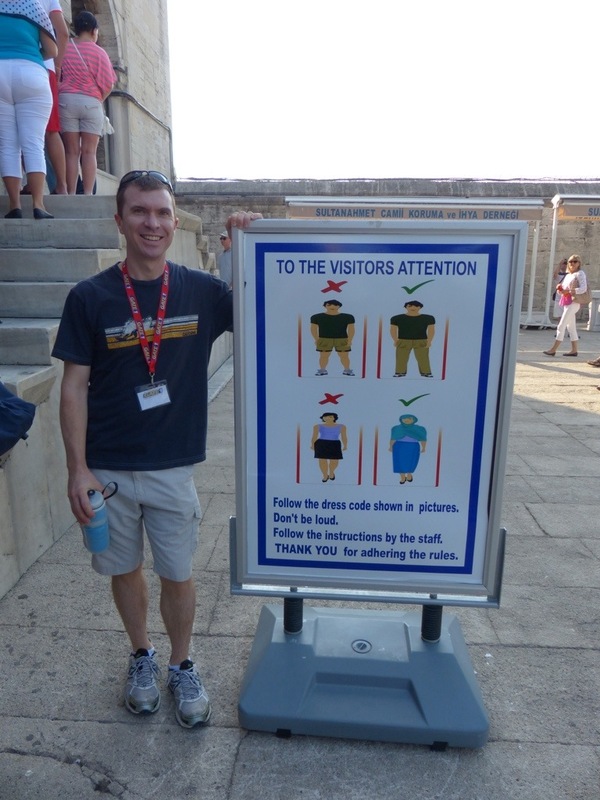 Rob and I are definitely used to doing things at our own pace while traveling and there were plenty of times during this trip when our tours moved much slower than we would have liked. But when you have a group of 40 people to accommodate we understood that it would have been impossible to please everyone when it came to tour speed. It was a bit frustrating at first, but we did our best to just go with the flow. Luckily, we had a wonderful group of people to share our travel experiences with and most of them didn’t seem to mind the slower pace of things. 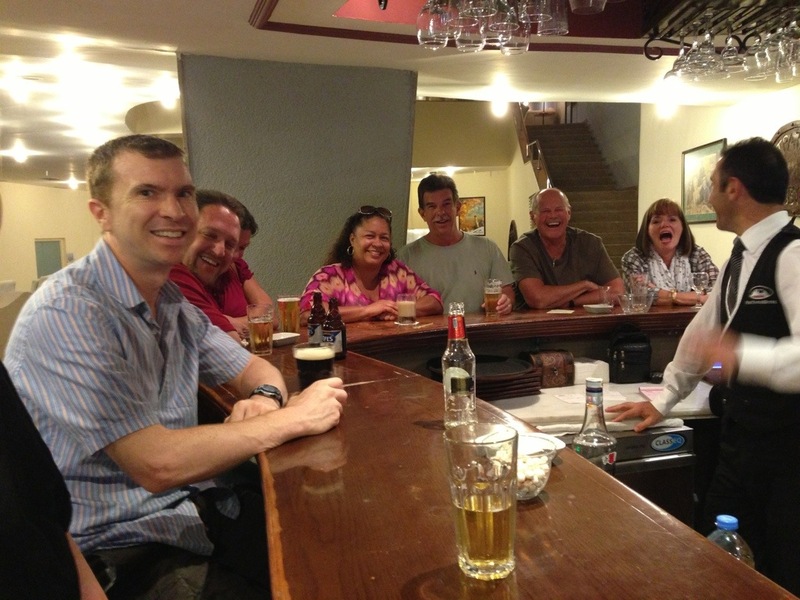 So Rob and I worked on our patience skills during the guided portions of our trip and then we were happy to relax and join our travel mates for drinks at the bar at the end of a very long day. Doing the guided tour thing was a bit of an adjustment for us since it is not what we are used to, but overall it was a terrific way to see the country! 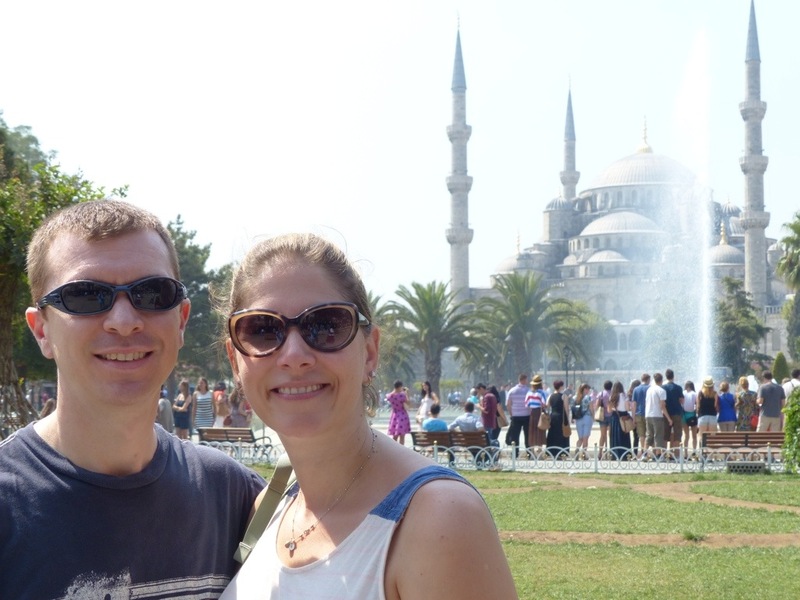 While we didn’t have as much time as I would have liked in any given city, I am quite happy that we were able to see so many parts of the country because there is so much more to Turkey than just Istanbul. I took more pictures on this vacation than on any other trip in the past so stay tuned for lots of upcoming pics. Until then, here are just a couple more. Leave it to Rob to make us look like little satans using minarets from a place of worship!